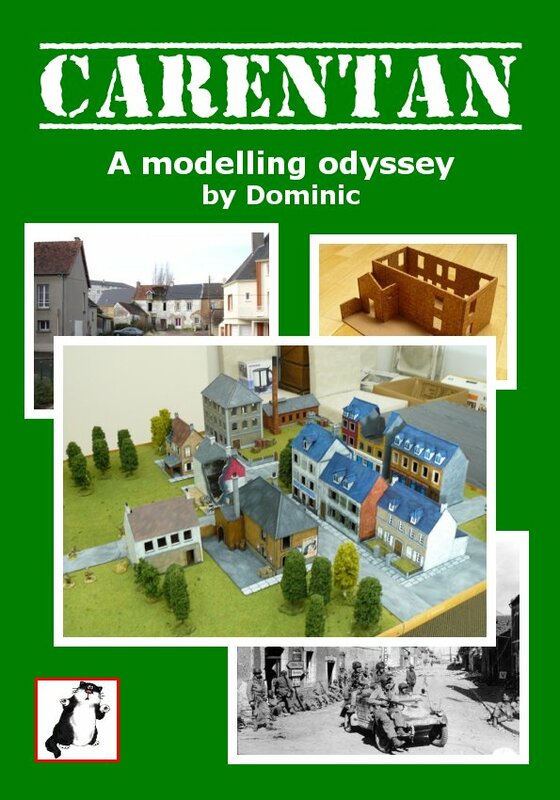 I received the Miniature Building Authority Cafe last Friday. 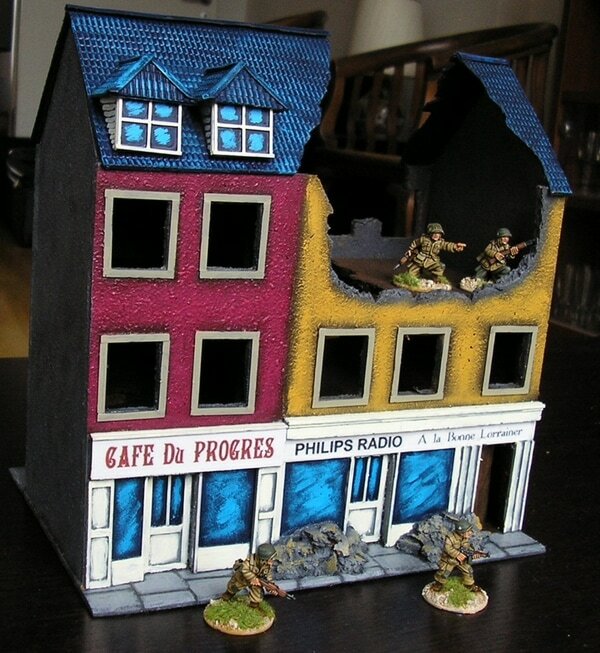 It's a good copy of the "Cafe de Normandie" which appears in the Band of Brothers' Carentan scenario. 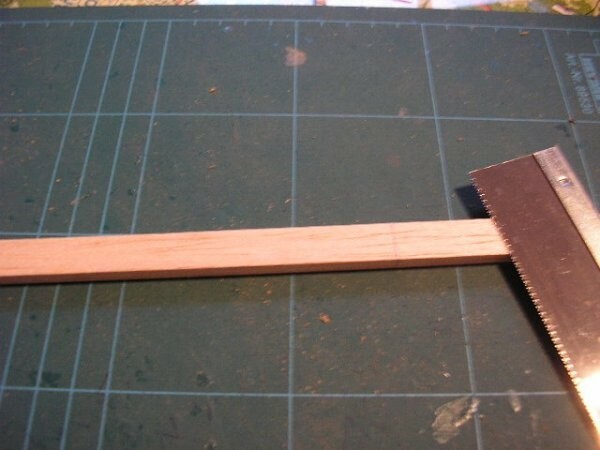 Here are some step-by-step pics for building Desire Ingouf. 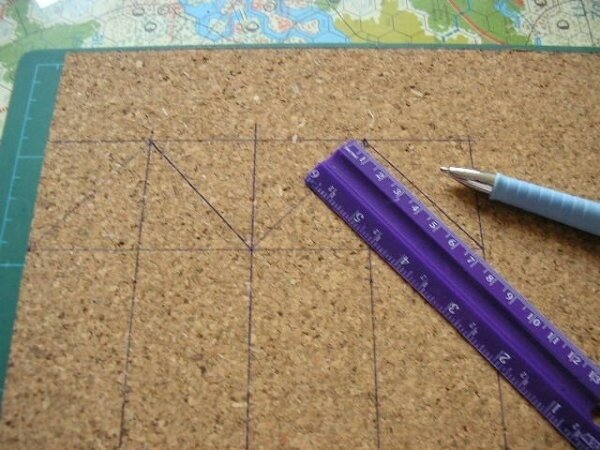 The measurements are all guesswork. There are pics of the 2 front sides. But the configuration for the 2 rear sides is also guess work! Back to building the restaurant. 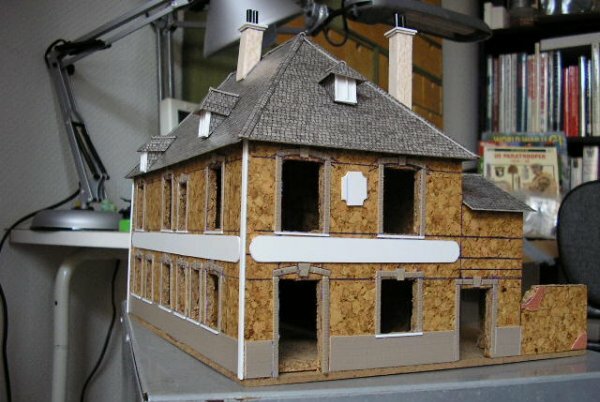 Here's the roof, the roof tiles are by Auhagen, a German railroad model company. 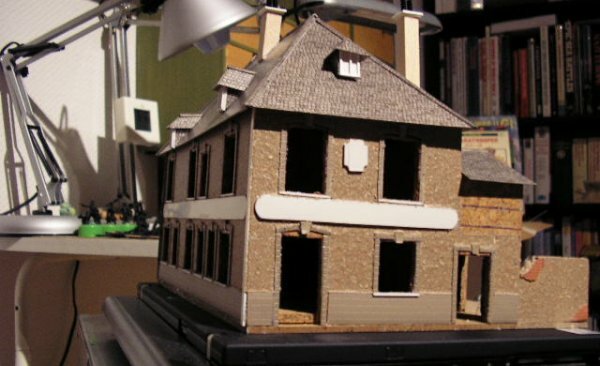 And now with the dormer windows added. 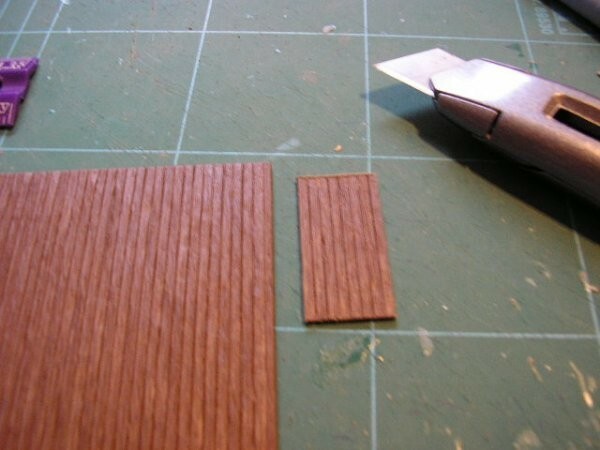 Now the detailing, I started with some textured tile sheets and cut them into strips for the window outlines. 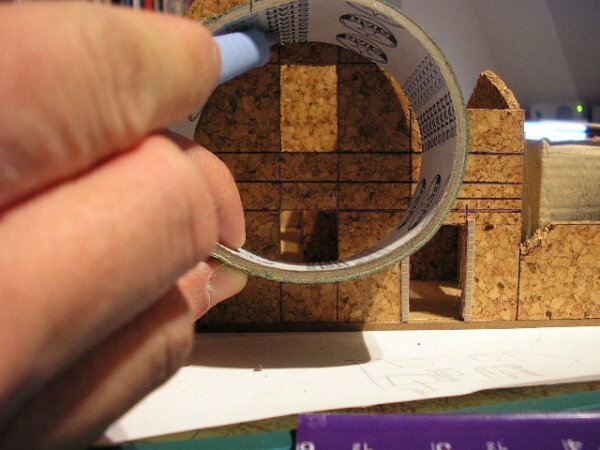 Then drew in the curved outlines at the top of each window using a masking tape roll as a template. 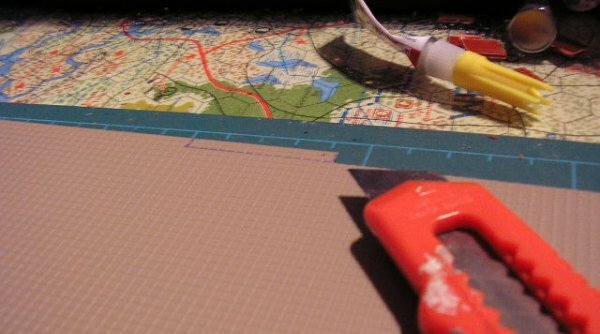 The next step is to mask off all the details in preparation for spraying. I'm going to use a granite textured spray paint to texture the walls. 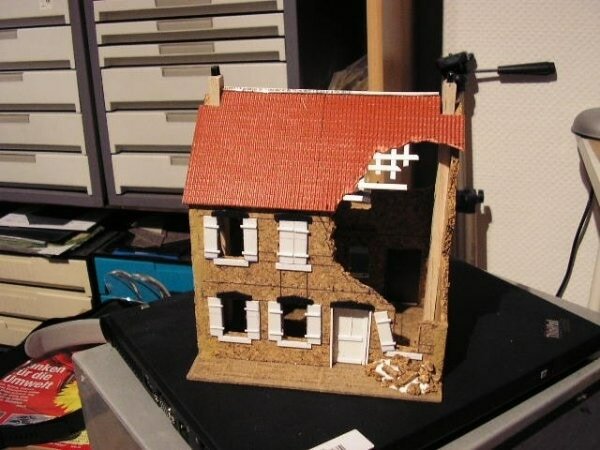 Here's the model after applying the granite texture spray paint. I was puzzled by the writing on the wall of this building. 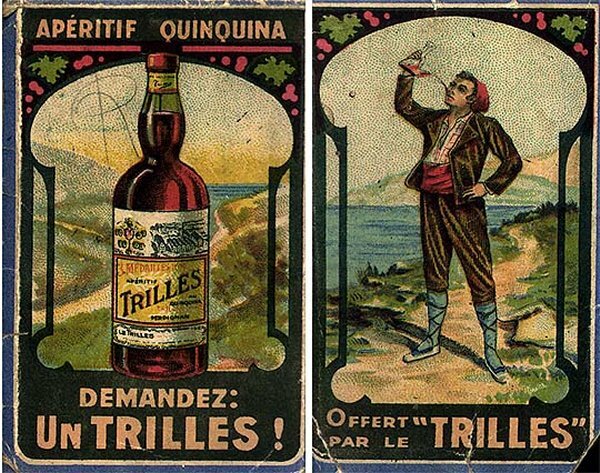 It looks like "TAILLES", meaning "measures", but that doesn't make much sense. 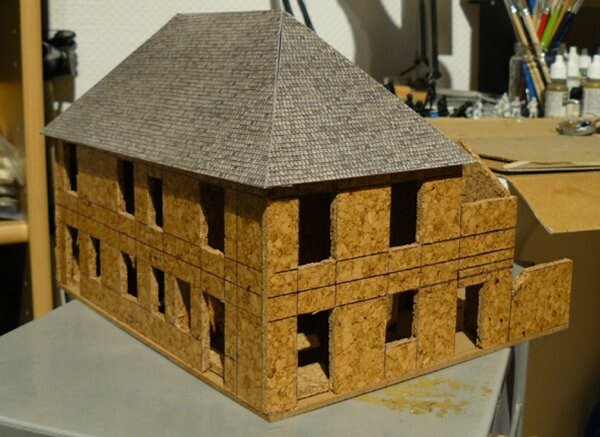 Here is the (nearly) finished building. It's not 100% complete as I'm still looking for a couple of suitable road signs for the front, and a big poster for the rear corner (next to the Normandie ship). 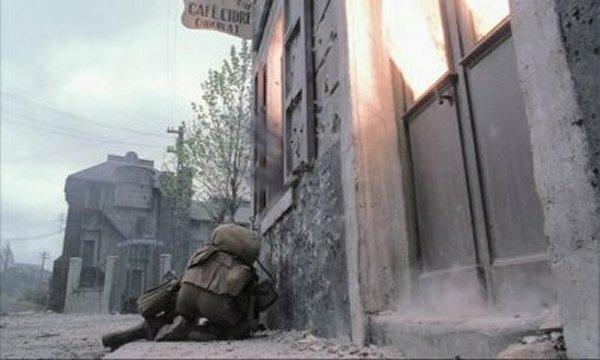 There is a specific poster that they used in the Band of Brothers episode. 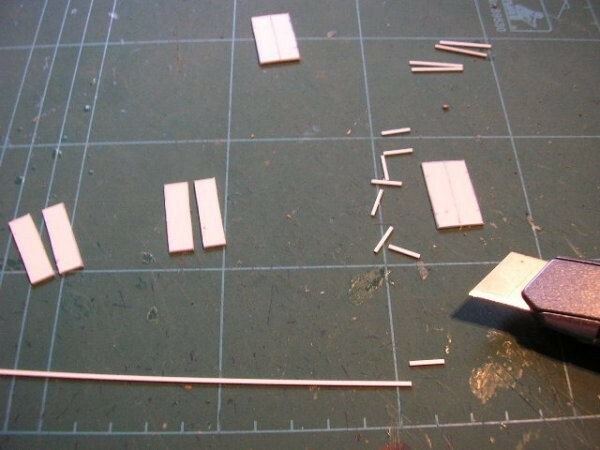 I bought some 1/35 Verlinden signs that are exactly what I need I scanned them and reduced them to the correct size. 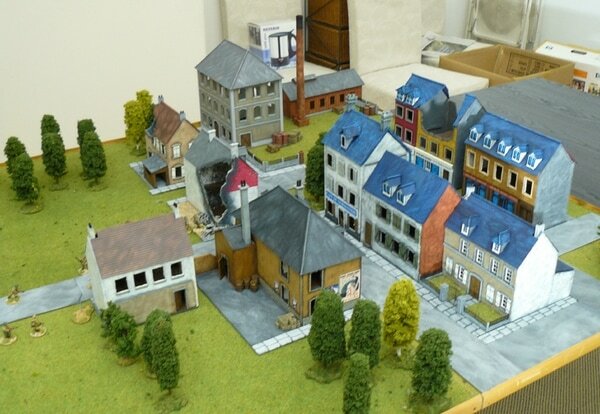 Here is the model with the road signs. I toyed around with adding windows, but after putting in a couple, decided against it as it became very fiddly. 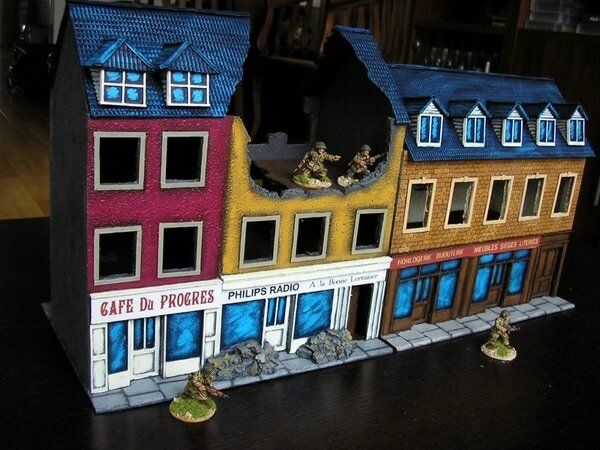 I figure most people won't miss it on the gaming table. I finally found the poster for the back that was used in the Band of Brothers episode. 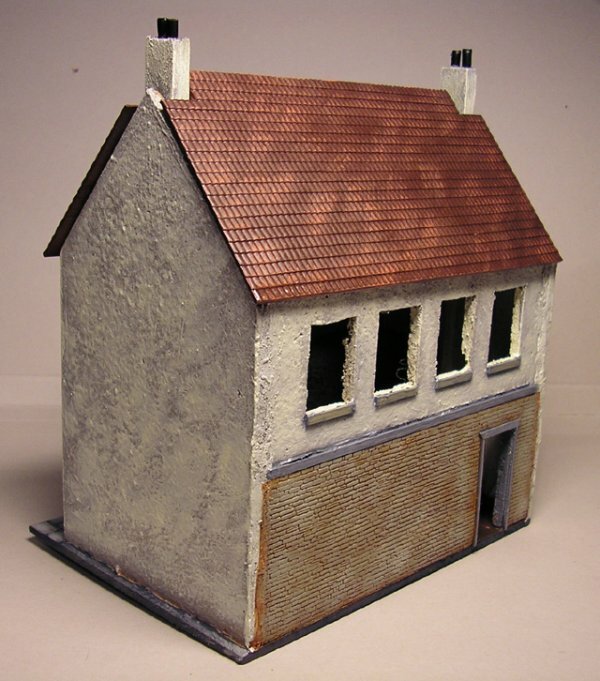 Carentan house number 2 completed! 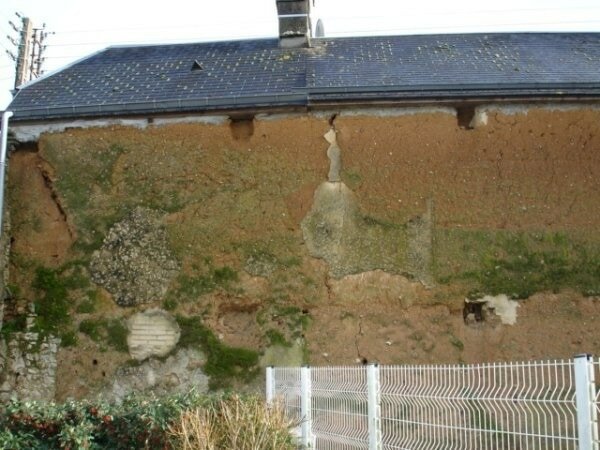 In Band of Brothers, this is the partly ruined house opposite Cafe de Normandie. There should be some posters on the right wall, and a big wall advertisement in the red-painted area. I will put these in later. 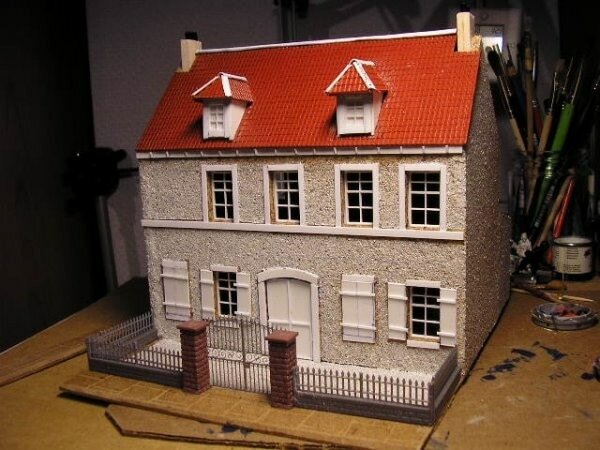 This house was really easy to build, and a joy to paint! 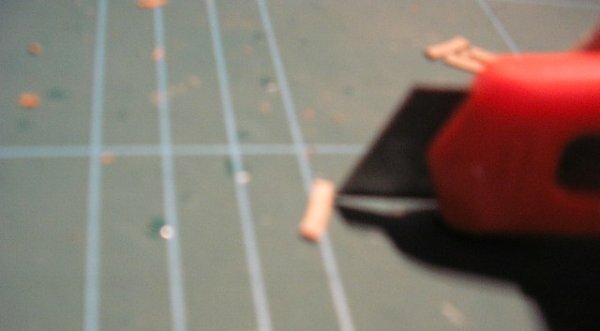 Basically it took one evening to build, (24hours waiting for the textured paint to set), and two evenings to paint up. Really fast! I considered putting beams under the roof but didn't get round to it. 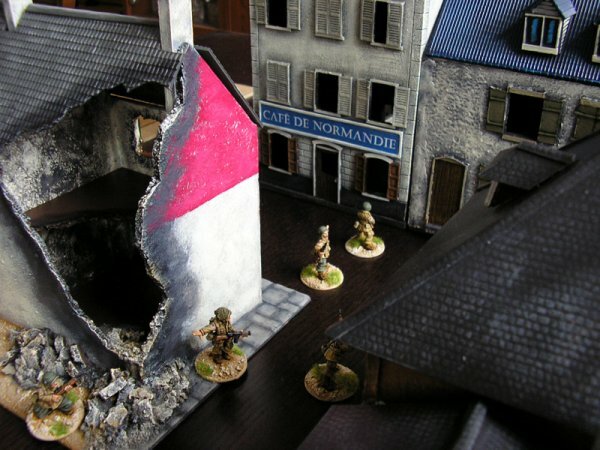 As you can see, the approach to Carentan is almost complete. 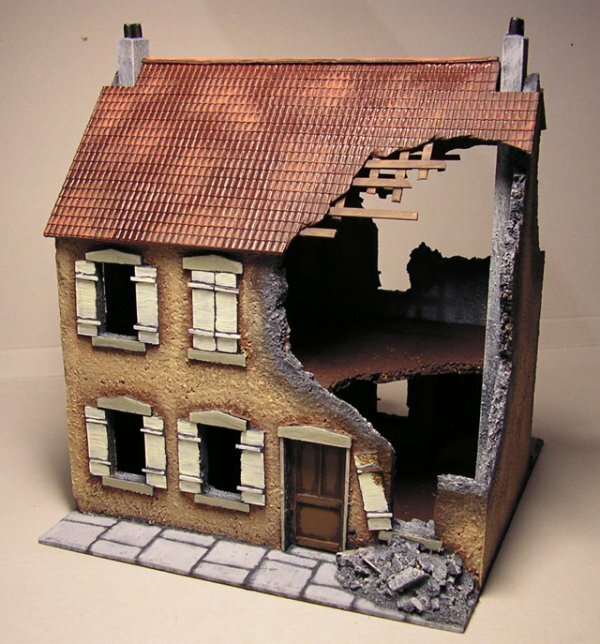 There should be one more house to the right of Cafe Normandie, and another ruined shop/house next to the existing ruined house. 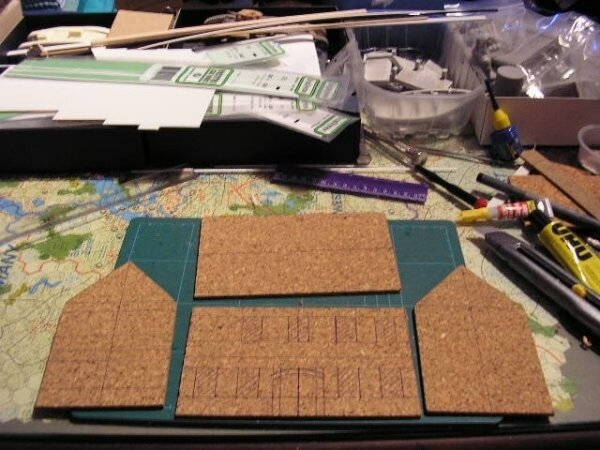 These will be my next builds. After that, I will have to start thinking about the factory. 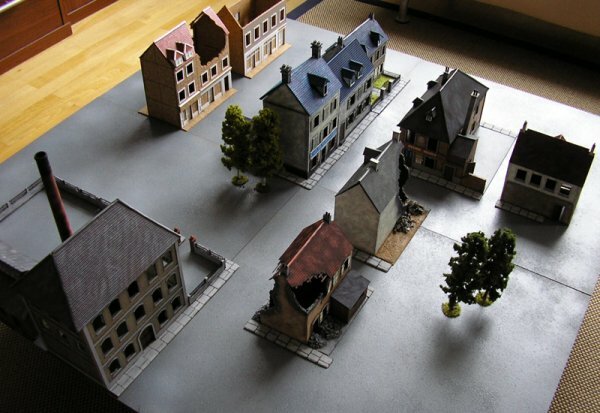 Here are more shots of the town from different angles. 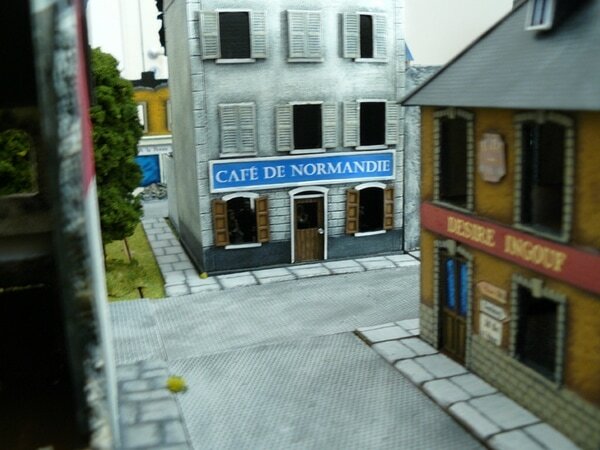 I figured Cafe Normandie should get a backyard since there is one in the DVD. 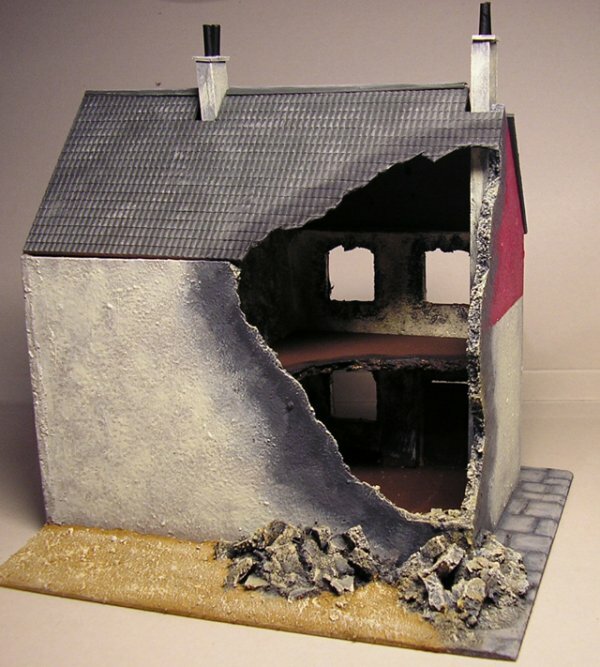 This house appears on the Band of Brothers Carentan set. 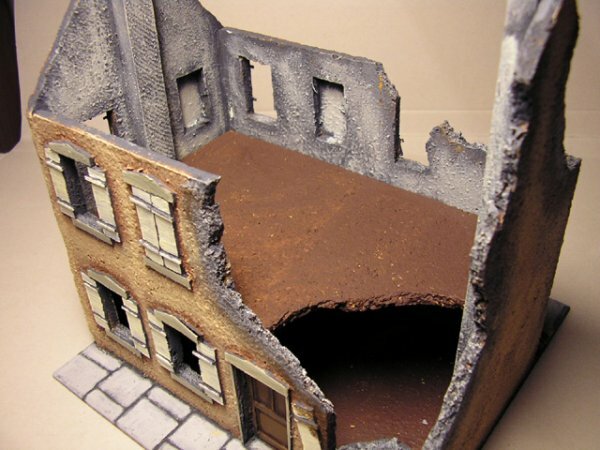 It is between the first ruined house and the factory/warehouse. 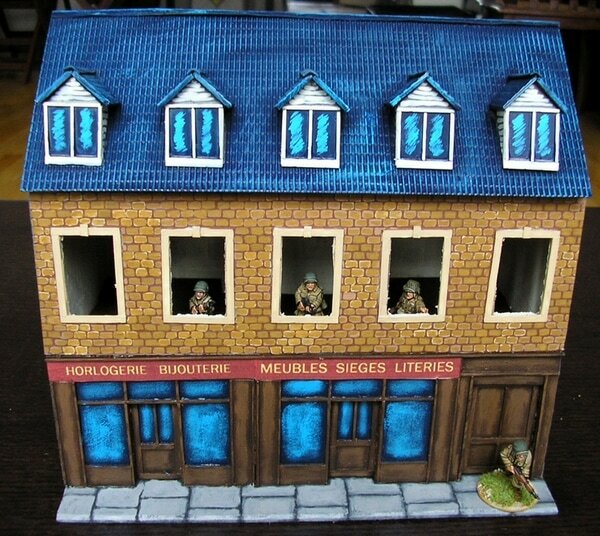 This is the house with the chicken coop at the back, where "Shifty" takes cover from the MG in Cafe de Normandie. 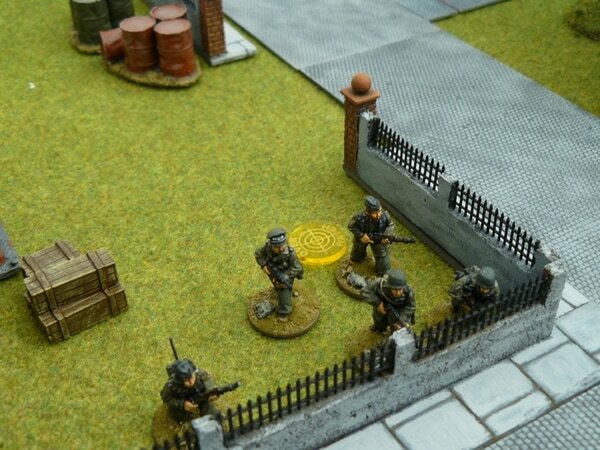 From this position, Shifty also takes out the sniper on the stairs of the factory. 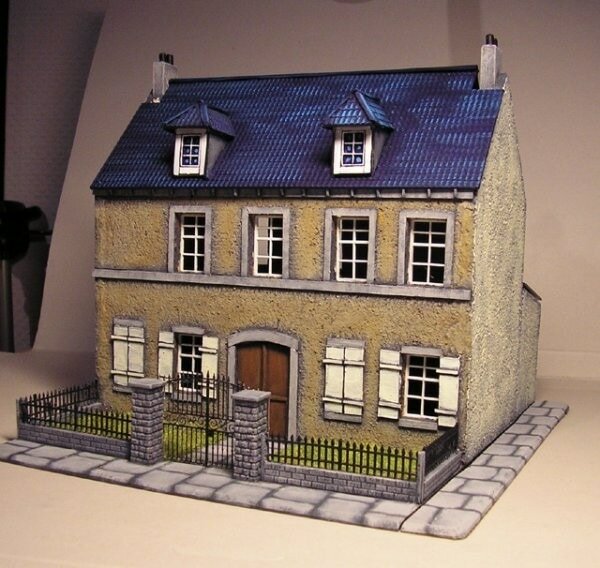 Unfortunately, I can't say if this house actually exists in Carentan. 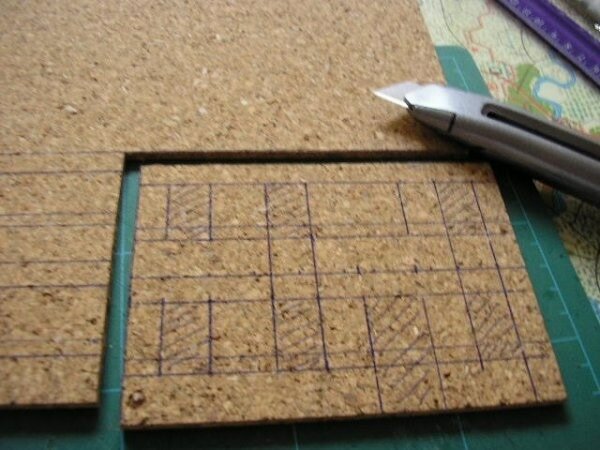 I use 30x30cm cork floor tiles which you can get from any building supplies store for around EUR10 for a pack of 10 tiles. 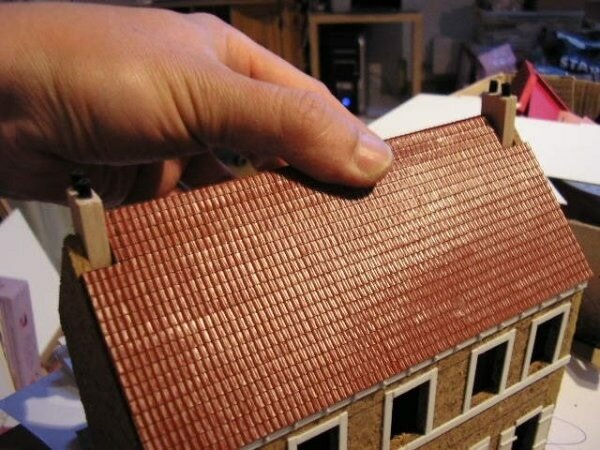 You need 1 tile to build a house of this size. The restaurant in the other thread required 3 tiles as it was much bigger. 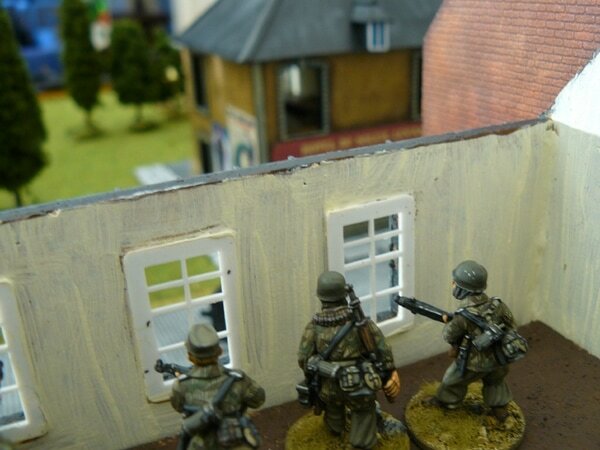 First, draw in all the doors and windows. 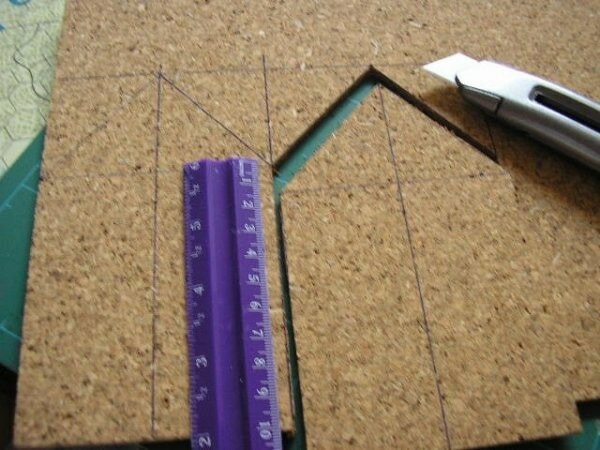 This will determine the dimensions of the house. 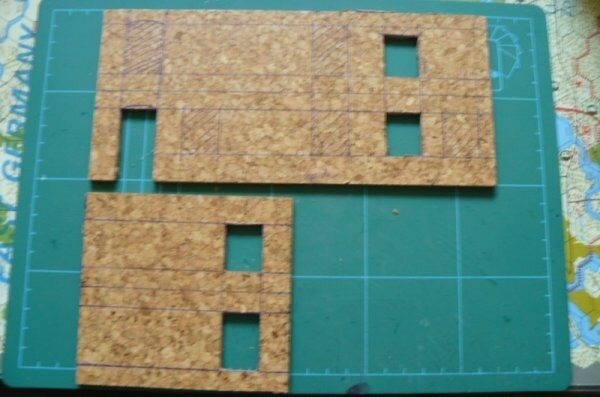 For this house, I've opted for 1.5x2.5cm windows and 2x4cm doors. 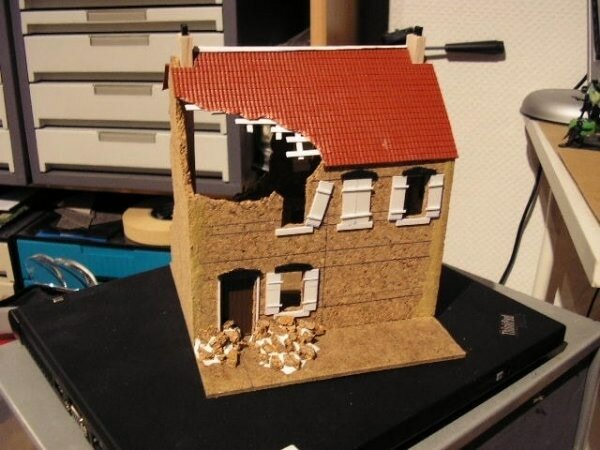 Each floor is 5cm high. 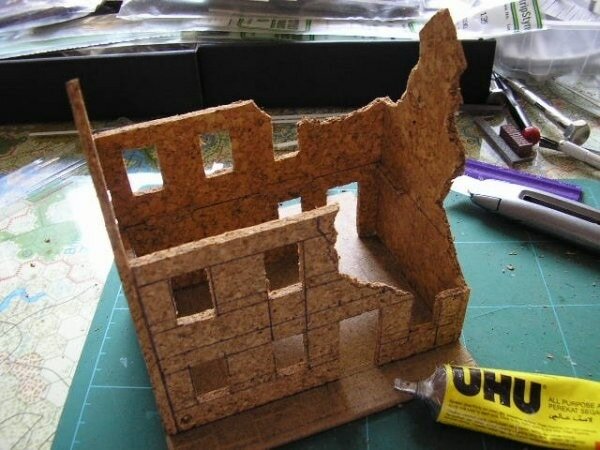 After cutting out all the walls, just sketch in the damaged areas. 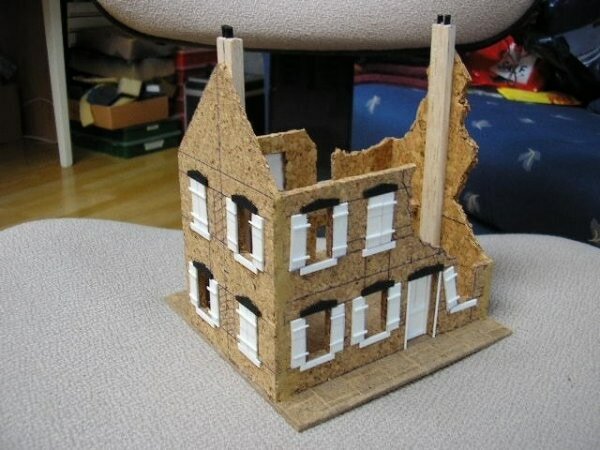 The ruined roof is fairly easy (yay! 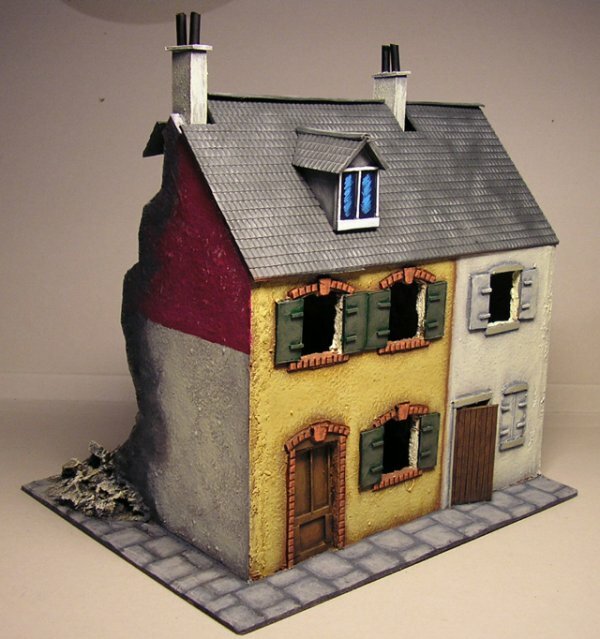 no dormers on this house!!) 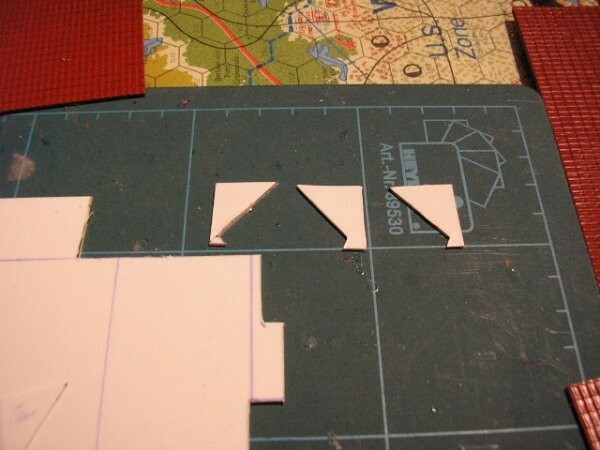 Just cut out the damaged part of the roof and use plastic strips to represent the damaged roof supports. 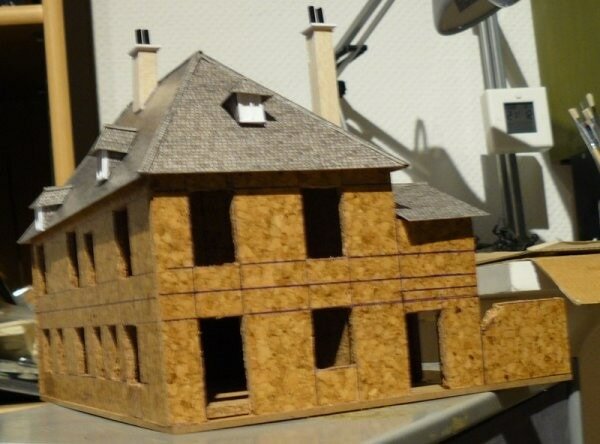 The roof is removable, and so is the upper floor. Thus the building is fully playable inside as well. 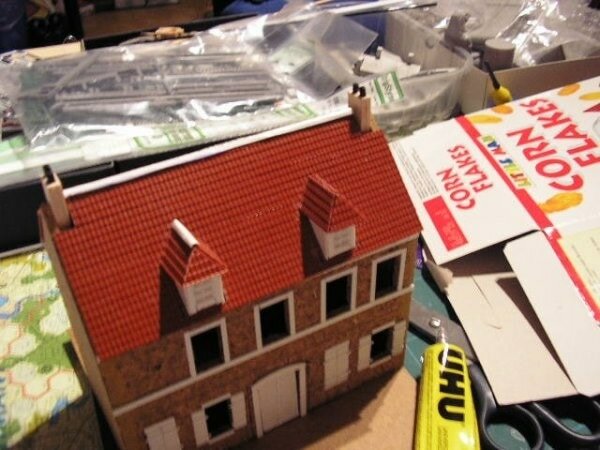 After the white glue sets overnight, the house will be ready for the next stage - masking, spraying with textured paint, and painting. 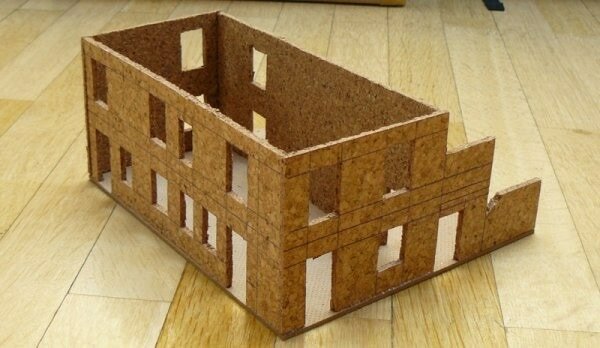 I need to make the factory next, then I will see if I need a few more houses (need some shops) to fill up a 120 x120cm board. 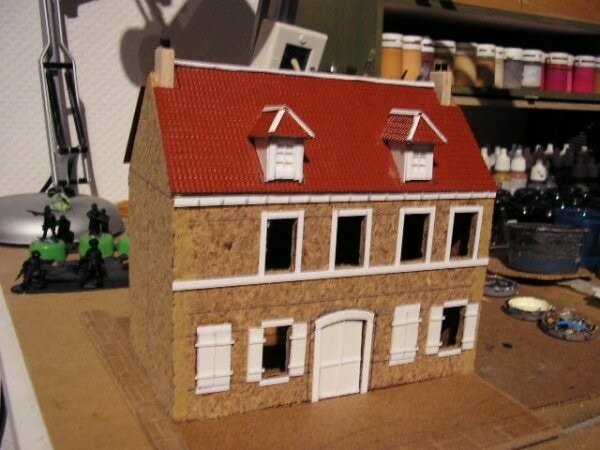 Here are some step-by-step pics on how I build an ordinary Carentan house. 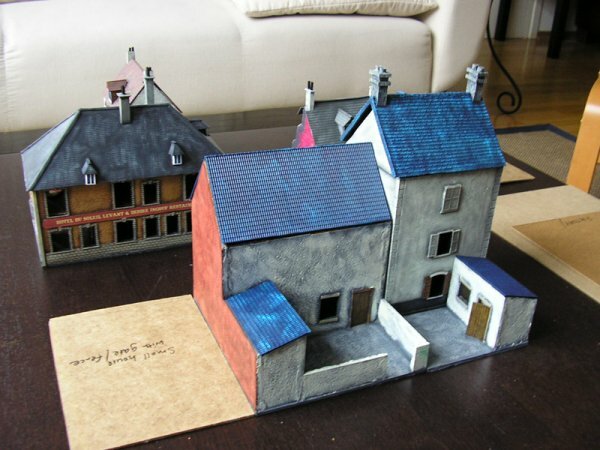 This is the house on Place de la Republique that I intend to reproduce. 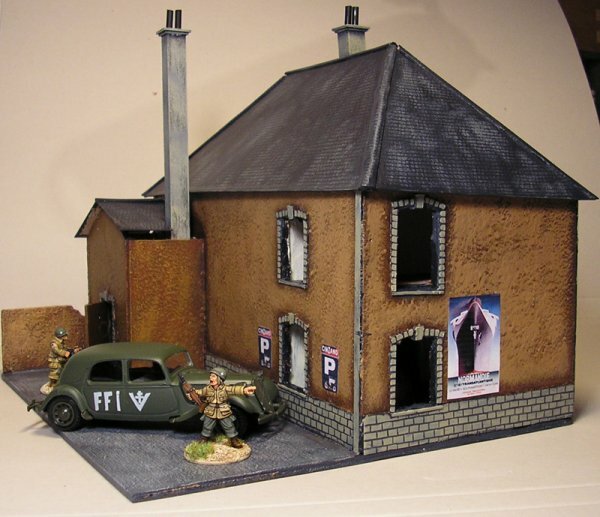 I believe this real house is the inspiration for the house that appears in Band of Brothers 2 houses to the right of Cafe Normandie. 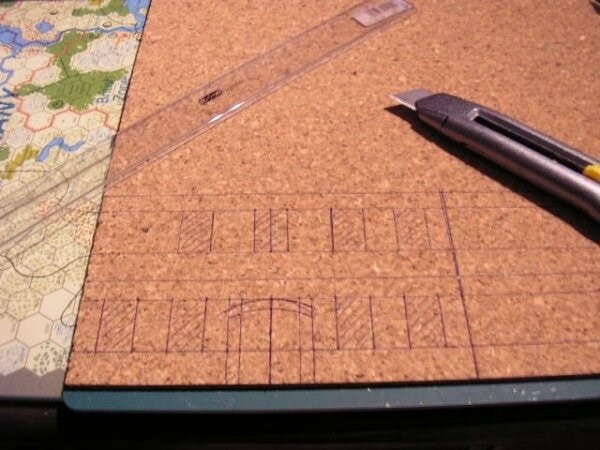 First step is to figure out where all the doors and windows are. 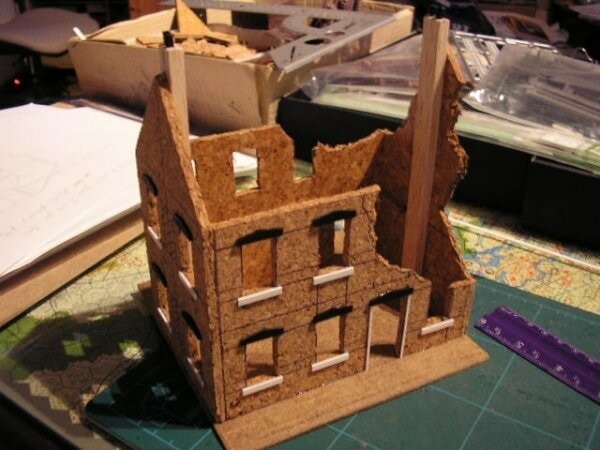 I normally make each floor 5cm high. 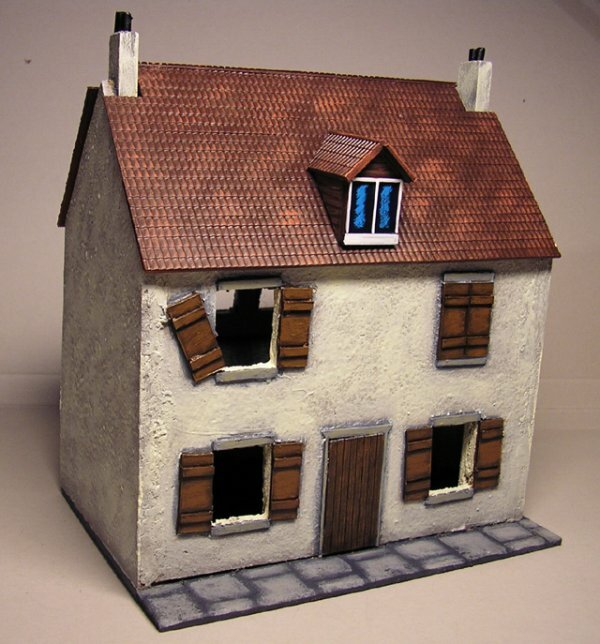 The doors are 4cm high and the windows 2.5cm. 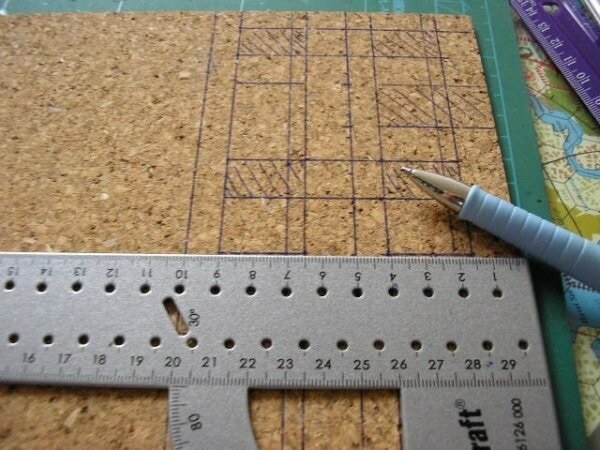 Went to the hardware store today and found this craft ruler thingy! I wish I had discovered it earlier! 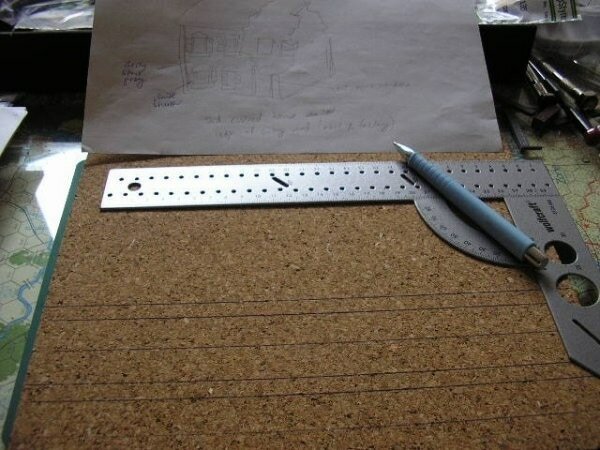 It makes measuring and drawing lines and angles such a breeze, I'm never using my old school plastic rulers again! I have no idea why the windows on the second story are set off centre. I've noticed that not all Norman houses are built symmetrically. Maybe there's a room there that doesn't need a window, or maybe it's a stairwell. 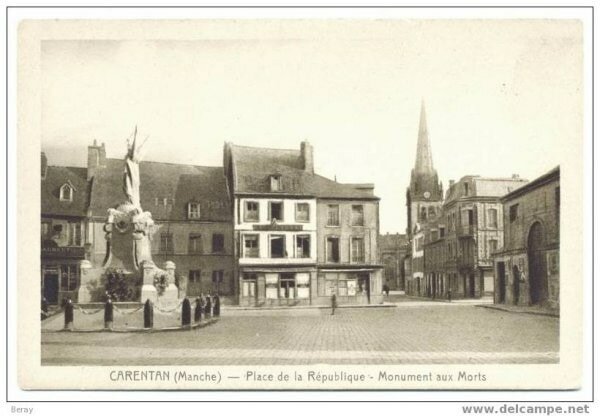 I found this old postcard on the web showing Carentan's main square with the WW1 memorial. From the look of the cars it could be either late-30s or just after the war. You can just make out the house I'm building on the extreme right. The small car on the right is either a Renault 4CV or a Fiat 600. Both where build after WW2. 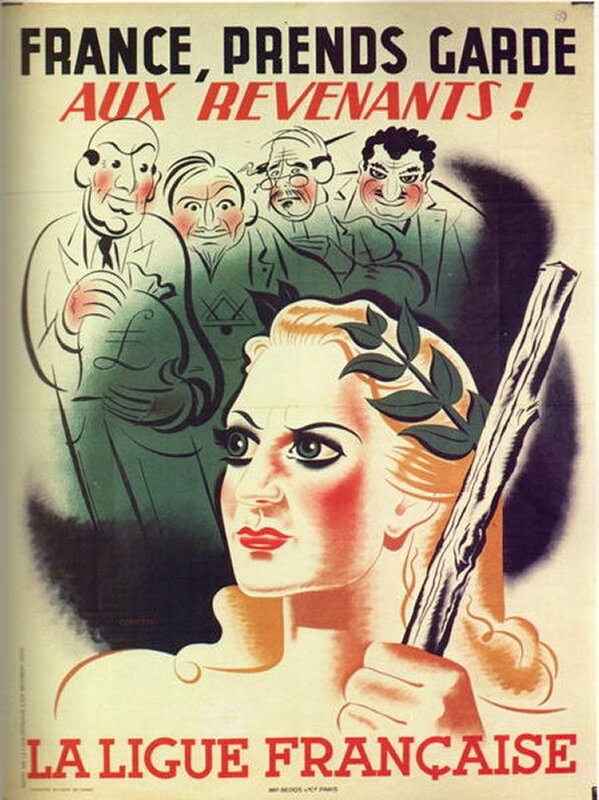 That makes the pic about late 1940s early 1950s perhaps? 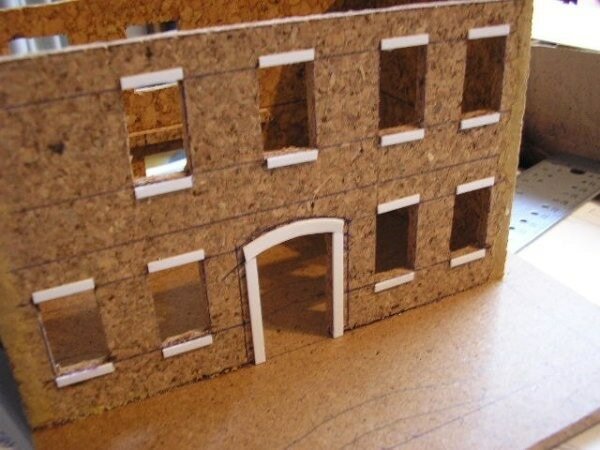 The window and door frames are cut out from plastic strips. 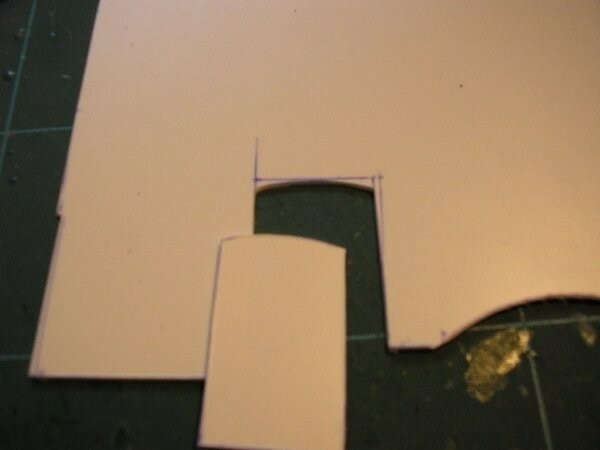 The curved part above the front door was cut out from a sheet of plastic card. 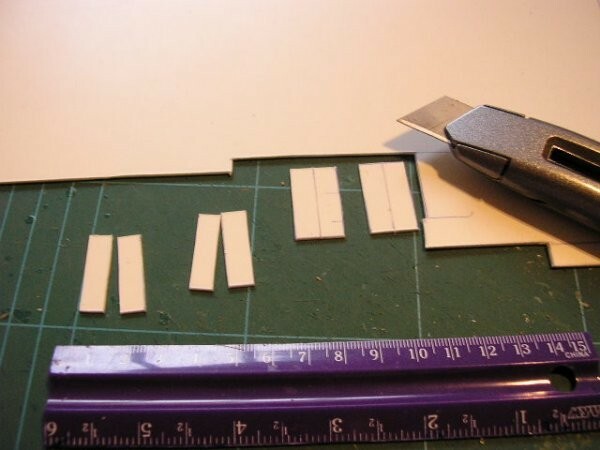 To do the window shutters, just cut out appropriate sized rectangles from plastic card, and use some strips for the hinges. Next come the doors. 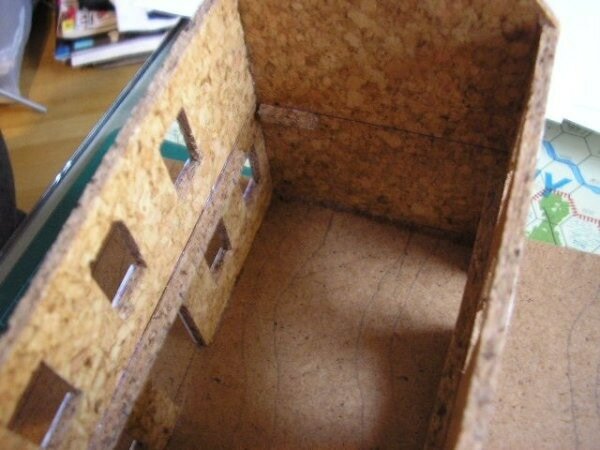 The rear door was cut from a textured plastic sheet obtained from a model train shop. The front door is cut from plastic card and decorated with plastic strips. 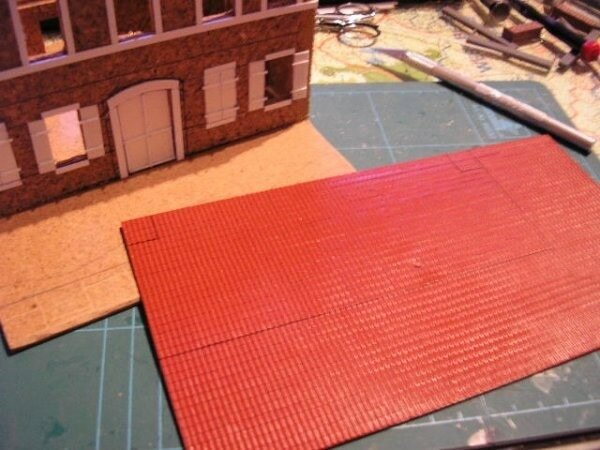 For the roof, I used textured plastic card from the model train store. 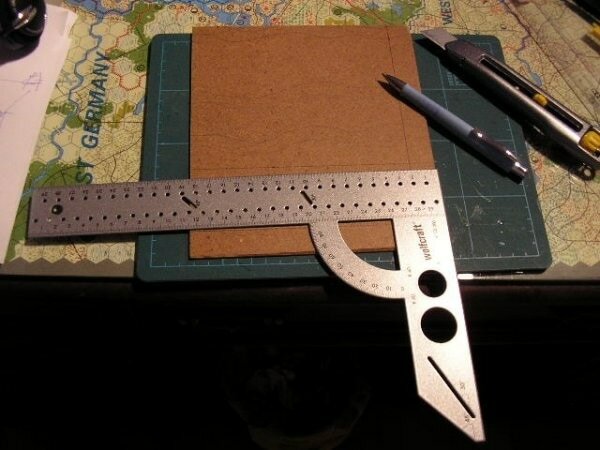 Just measure it and cut it out with a Stanley knife. 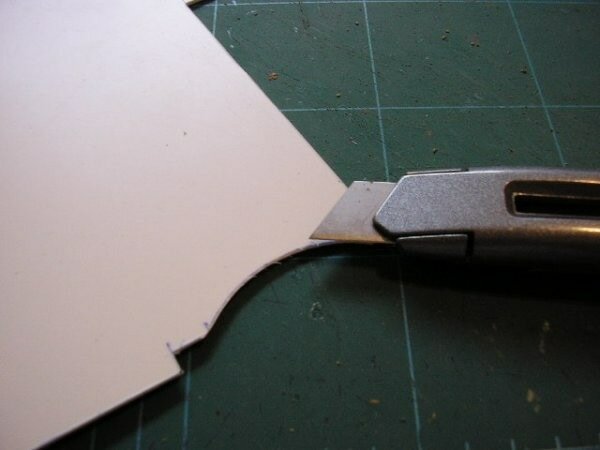 Did I say already how much I love my new Stanley knife? 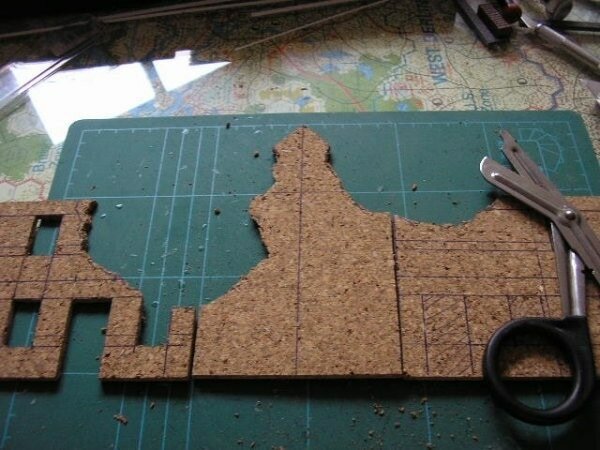 It cuts through plastic, cork and MDF so easily!! 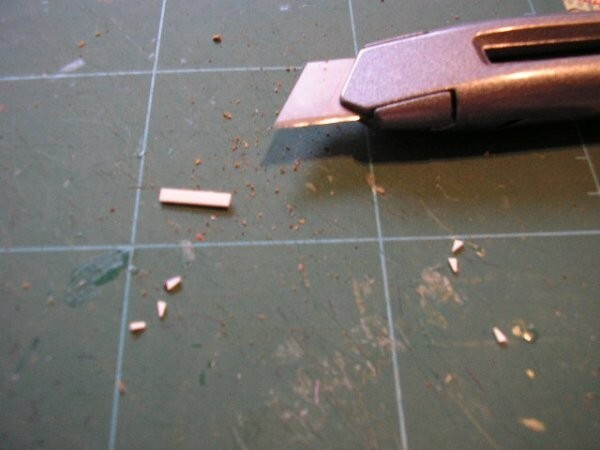 On the other hand, my old and cheap box cutters don't work as well and require a lot more effort to cut. 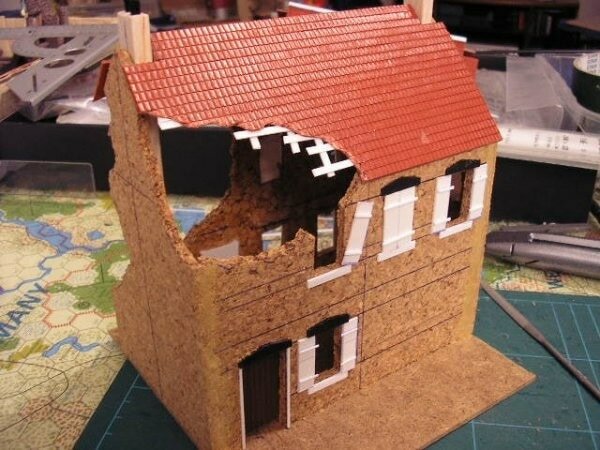 Don't forget to cut a bit of indentation in the roof to allow for the chimneys! 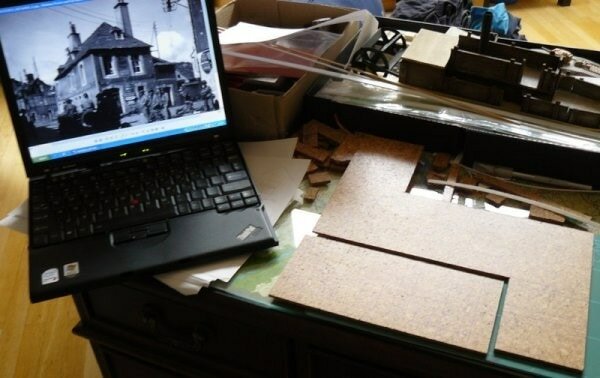 These roof tiles are from Vollmer, a German model railroad company. 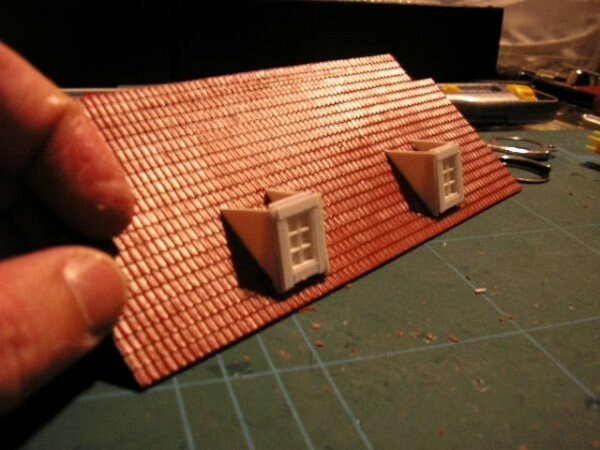 On some of my other houses, I used roof tiles by another German company called Auhagen. You could also use other brands, for example the ones stocked by Antenociti. 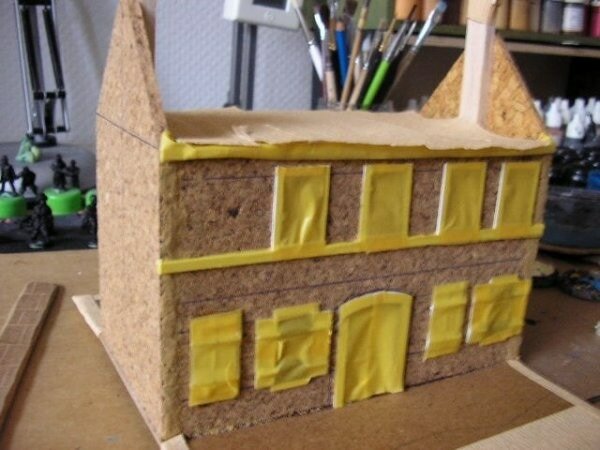 Dormers are a bloody hassle, but they have to be done! 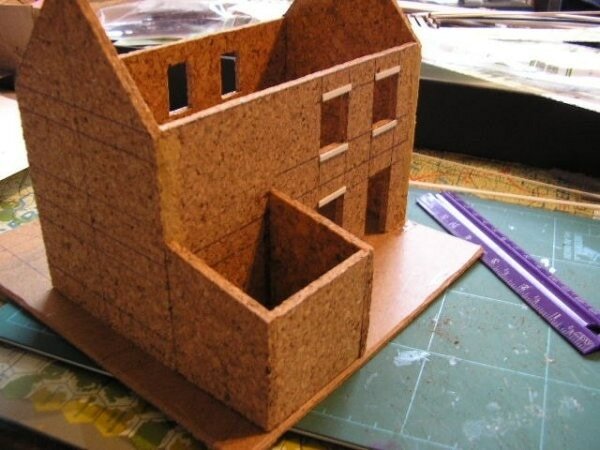 Start first with the side walls. 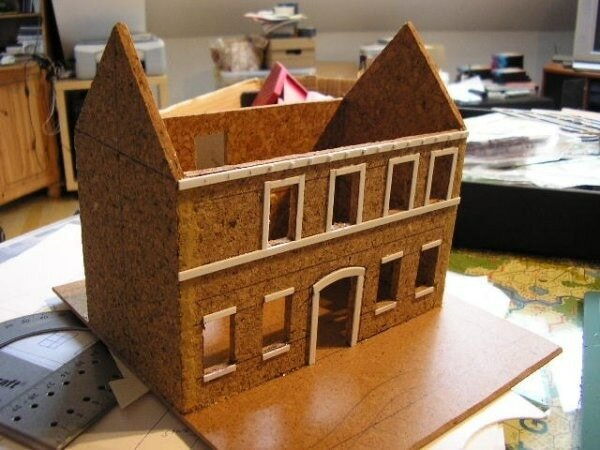 You have to get the angle right, otherwise the dormer won't sit straight! 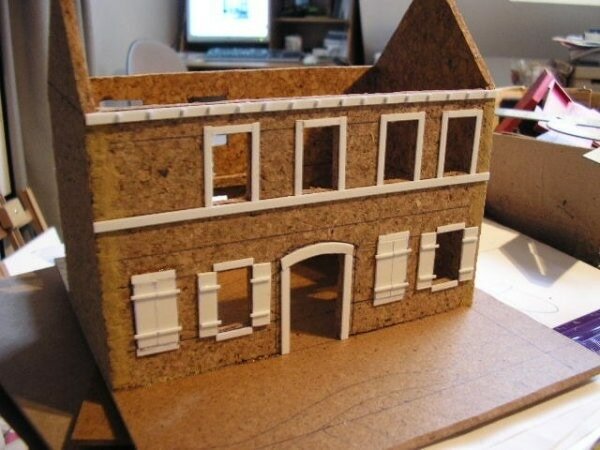 The little tab at the bottom of the side walls is for supporting the dormer on the roof. 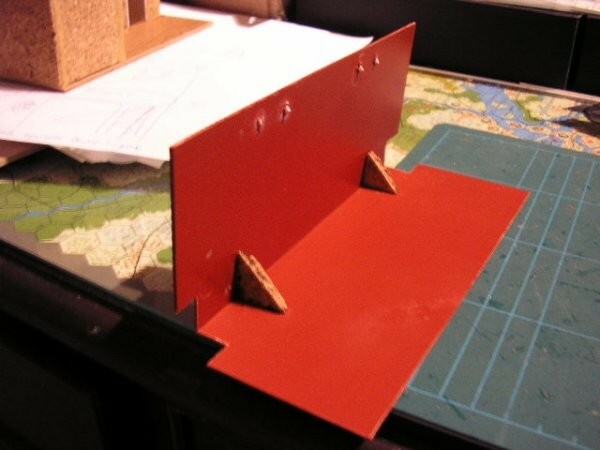 Cut a hole in the roof that will fit the tab. 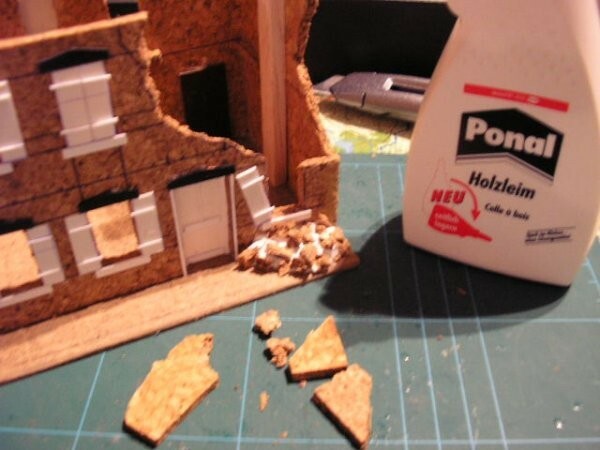 This will ensure that the dormer doesn't slide off while the glue is drying! 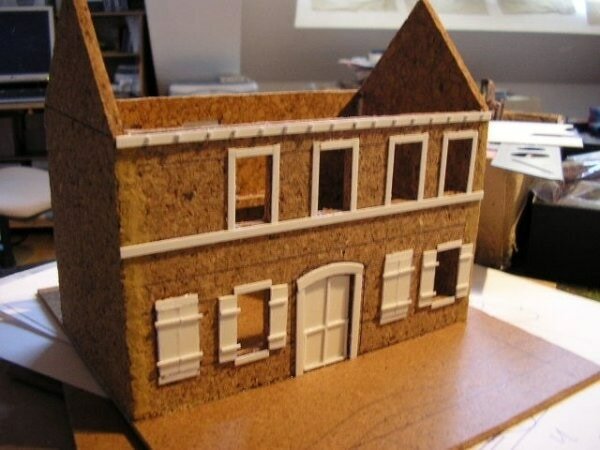 I got so stressed building the little roof for the dormer, I forgot to take pics. So here is a pic of the step after the dormer roofs have been built and fitted. 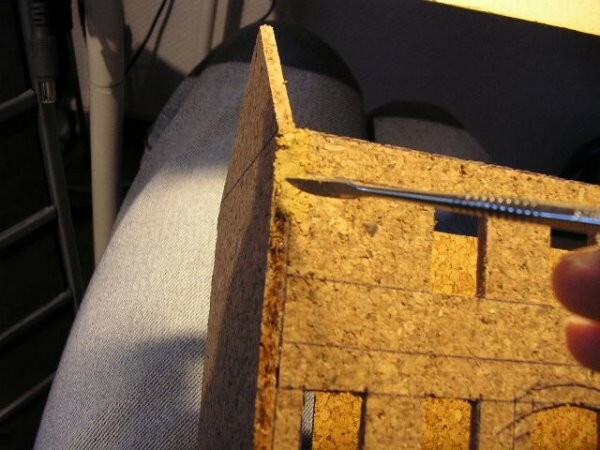 Join the main roof together and add triangular supports to strengthen the joint. 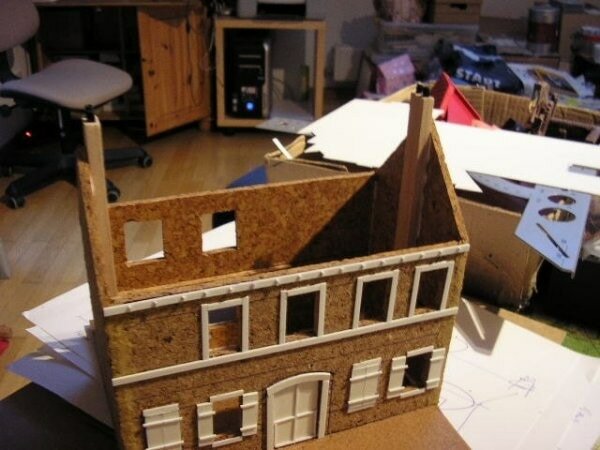 In this pic, you can see what the dormer roof looks like. The fiddly part is getting all the angles right. 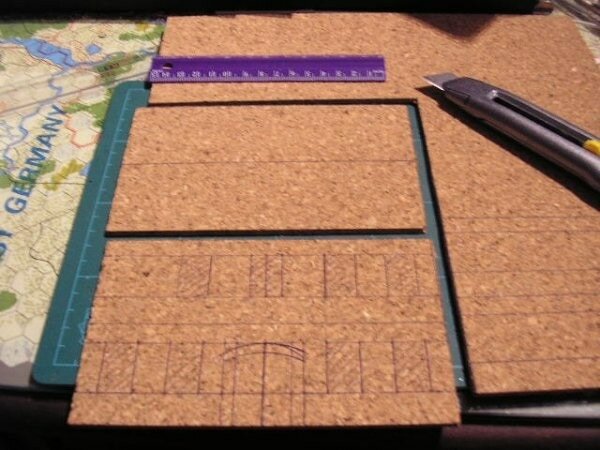 I haven't worked out a good way to do this yet, so it's all trial and error. 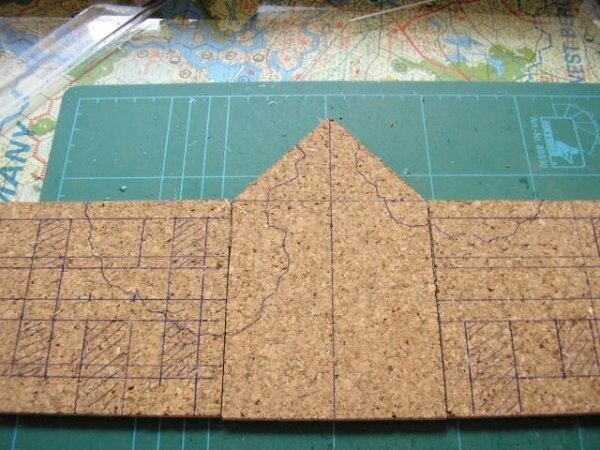 After joining all the roof tile pieces together, hide the ugly seams with strips of card from a corn flakes box! 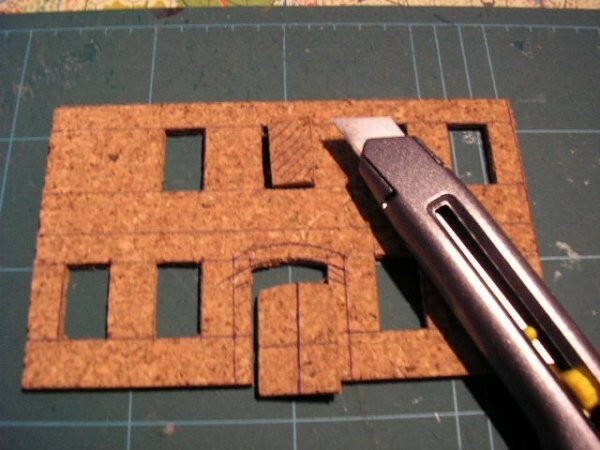 I haven't fitted the gate and garden walls yet as I'm going to spray the house with a granite-texture spray. I'll put in the walls and gate after the texture spray has gone on. So the next step is to mask off all the windows and doors in preparation for spraying. 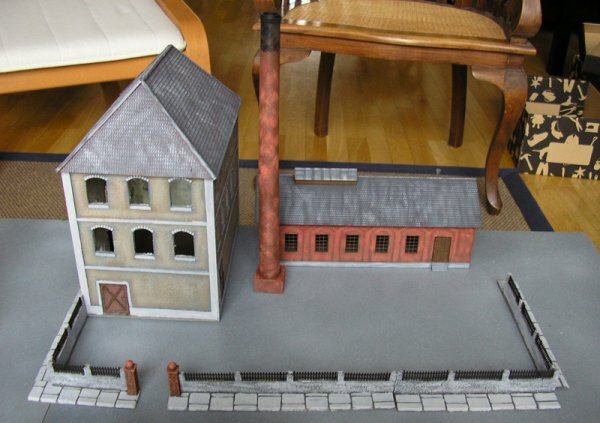 The fences and gate are from Faller, another German model railroad manufacturer. 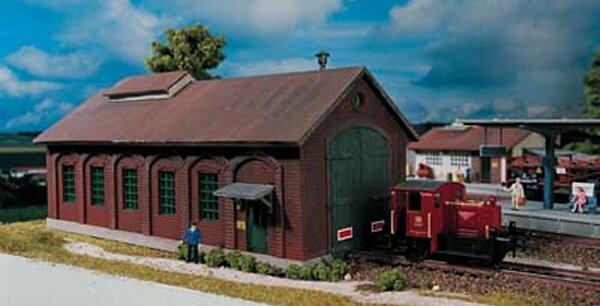 The Faller fences are HO scale. 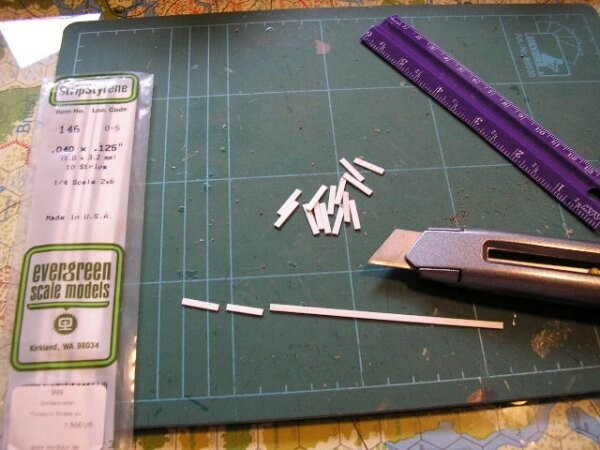 I guess they are meant to be full height for HO, but they work well as low fences for 28mm. Finally! 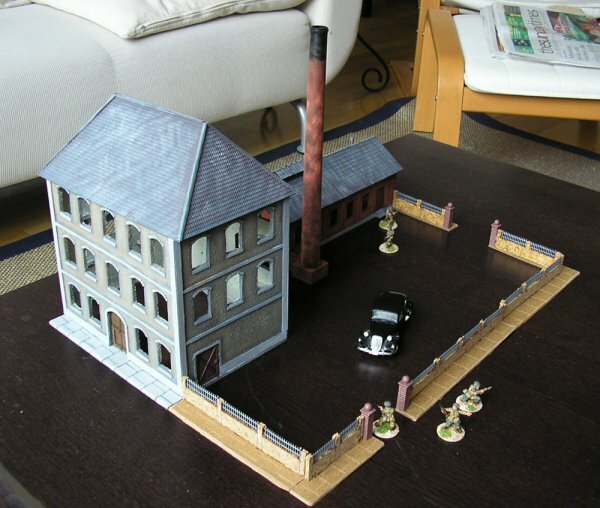 Completed the factory! Still need to paint the walls and sidewalks though. 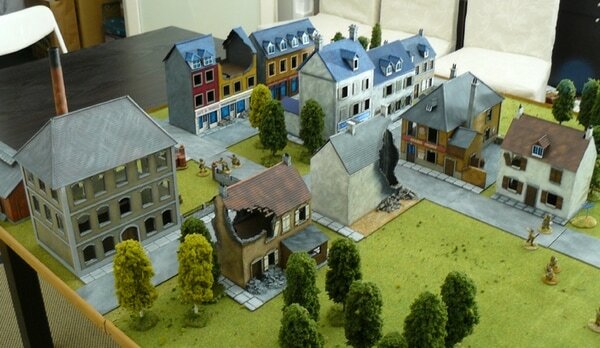 Here's what Carentan looks like so far. 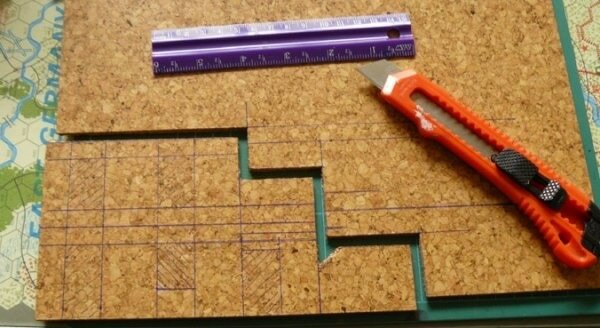 I've made a 4'x4' (120 x120cm) board out of MDF. I'm not sure I like the look of it as the grey is just a bit too overwhelming. 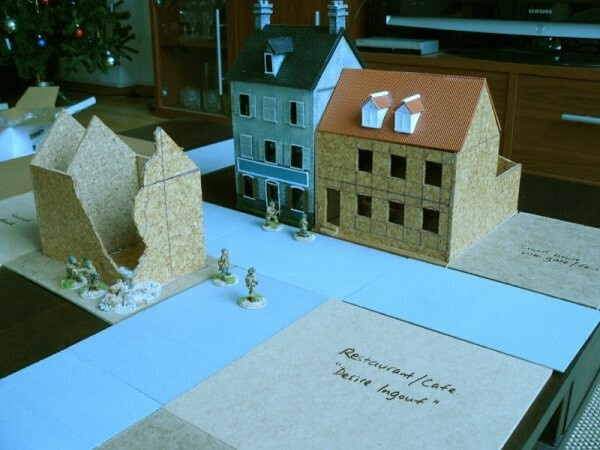 I think it might be better to use a grass board with cobblestone streets placed on top. 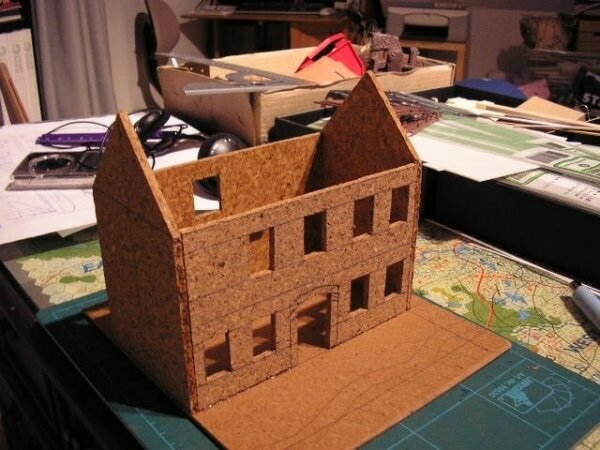 Here is the method for building the factory. 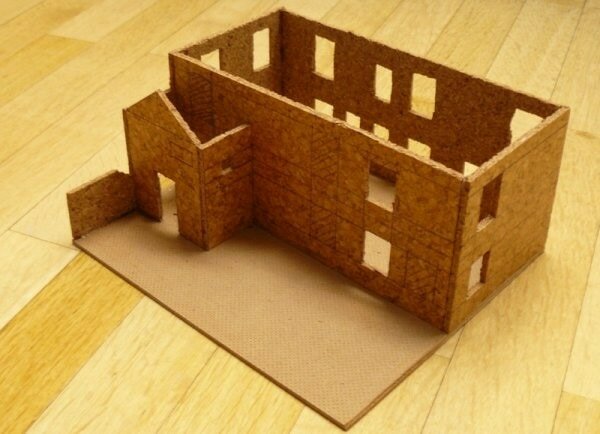 The administration building (pictured below) is made from cork. The building front, sides and rear are measured as before, and the windows and doors cut out. 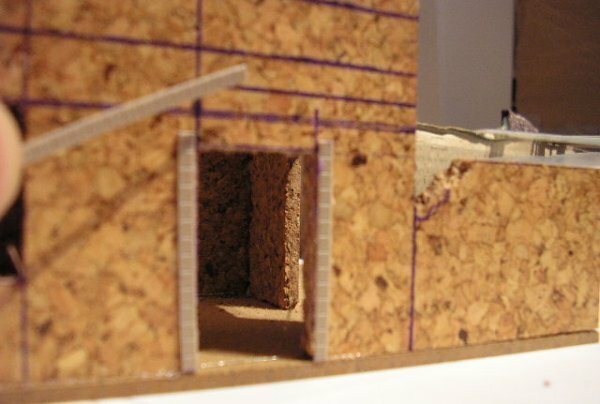 Plastic strips are used for all window and door frames. 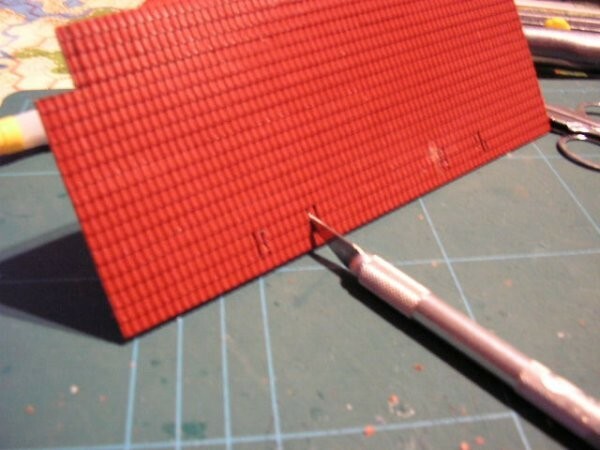 The roof is a textured plastic sheet from Vollmer, cut to the appropriate size and glued together. 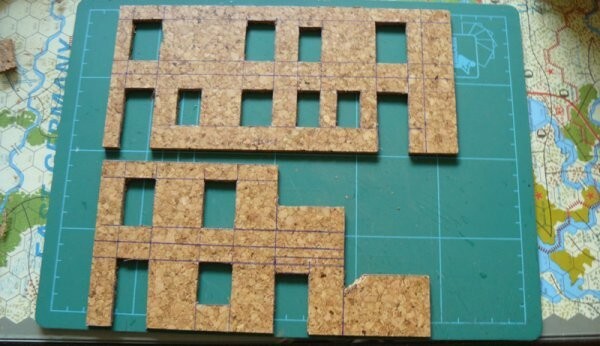 As you can see, the walls are simply cork cut to the required shape and glued onto MDF board in which I have scored a pavement pattern with a knife. 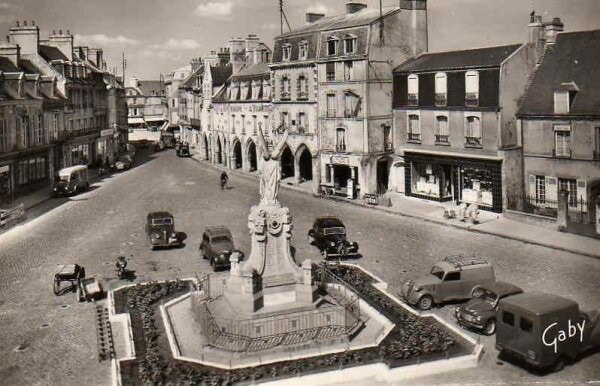 This is a view of the square after the city was captured by the US 101st Airborne in 1944. 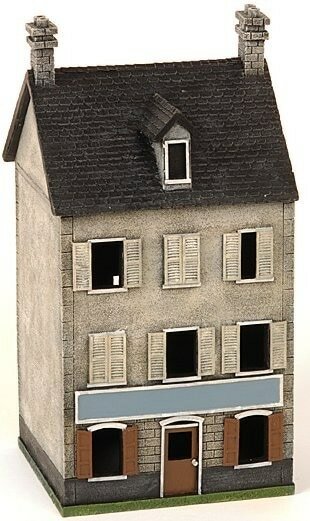 I decide to build the houses starting from "Cafe du Progres" to the "Horlogerie, Bijouterie" and "Meubles"
Unfortunately in both these pics, you can't make out the full structure of the Horlogerie - Meubles house. 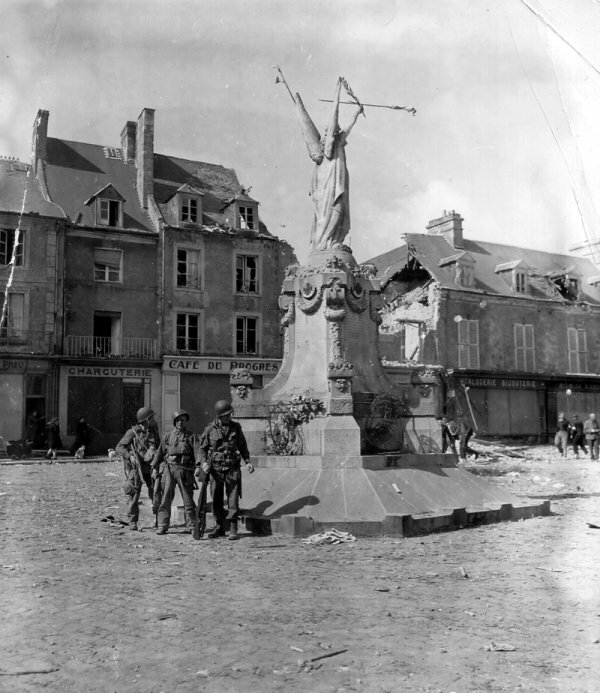 I managed to find this picture showing a victory parade on Place de la Republique, showing quite clearly what this house looks like (on the left). 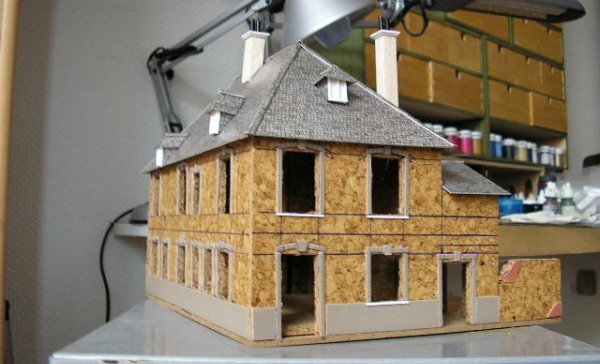 It will take me a bit of time to make the roof of the horlogerie-meuble house as it has five(!!) 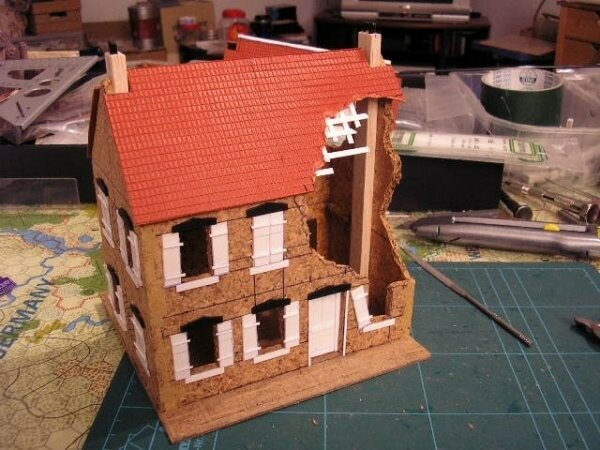 bloody dormers!! 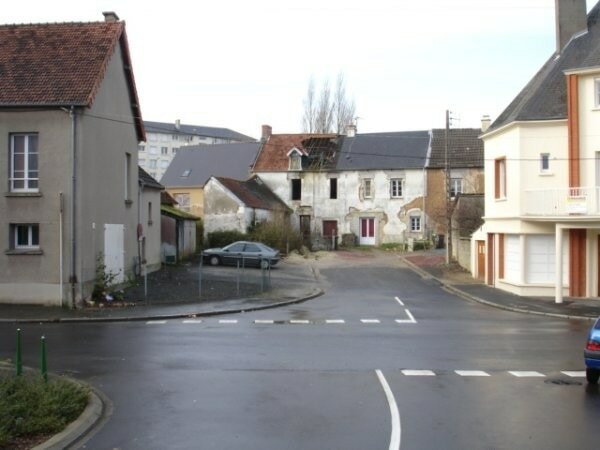 Here's the famous crossroads from which Easy company/506th PIR attacked Carentan. This was taken in 1944. 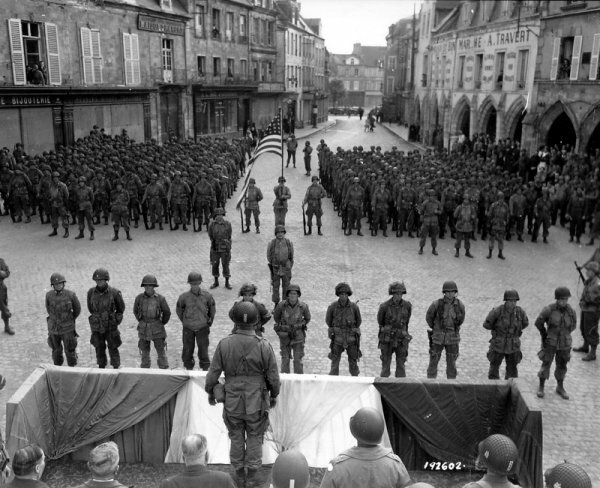 According to the picture in Ambrose's book, Band of Brothers, Easy Company came from the left side. Here's the picture taken from the same place nowadays. It's really changed a lot. 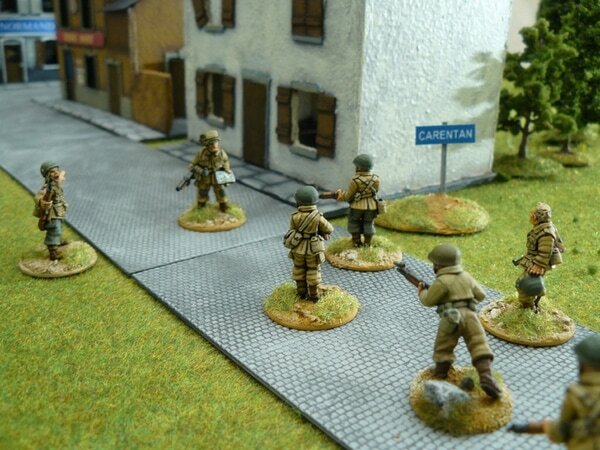 The road on the left drives you to a private housing estate but there were only fields during the war. Here's the picture taken from the road from which Easy Company arrived. 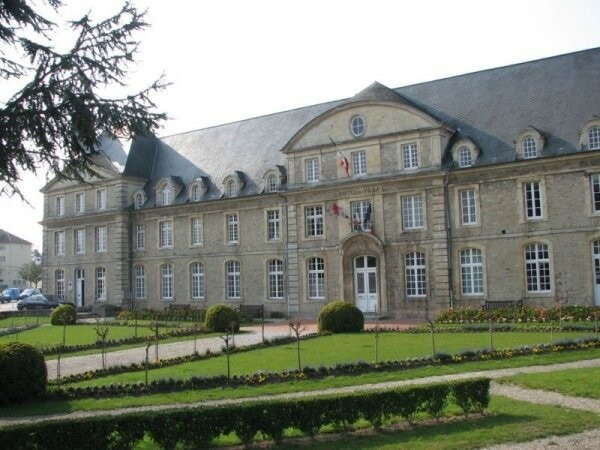 It's a gentle slope, with in the front, old buildings, which, from what I learned from the older inhabitants of Carentan, existed in 1944. 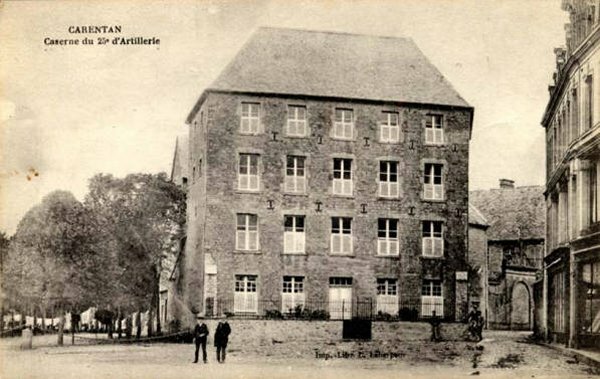 We can suppose that the MG42 was in position in this building. On the left side, there's a wall with visible bullets marks. That's the only hint of fight in the area. 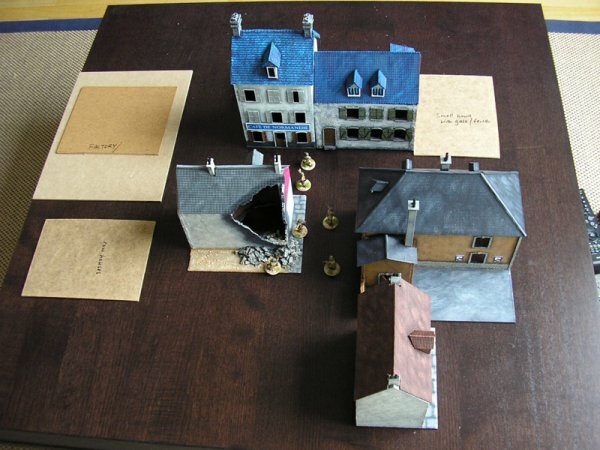 Now I understand better the path of Easy Company through Carentan. 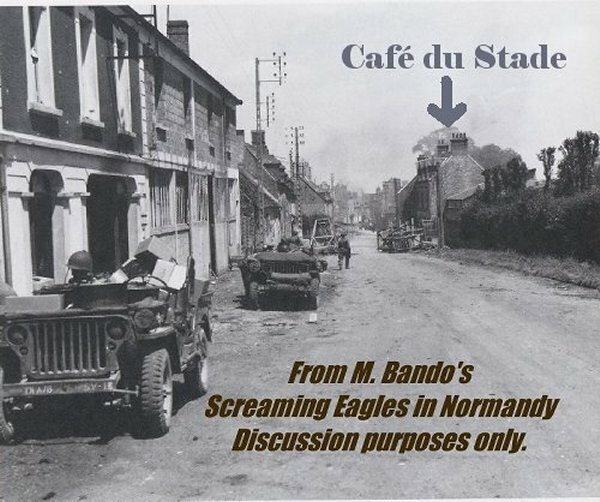 So there was no Cafe de Normandie... and they did not pass Chez Desire Ingouf Easy Company, part of 2/506, arrived in Carentan to the Southwest which is to the left of this photo. 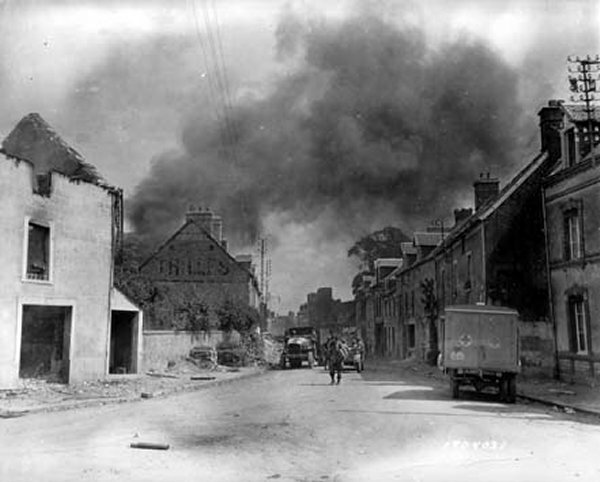 They attacked across Rue Holgate south of the rail track towards this group of houses. 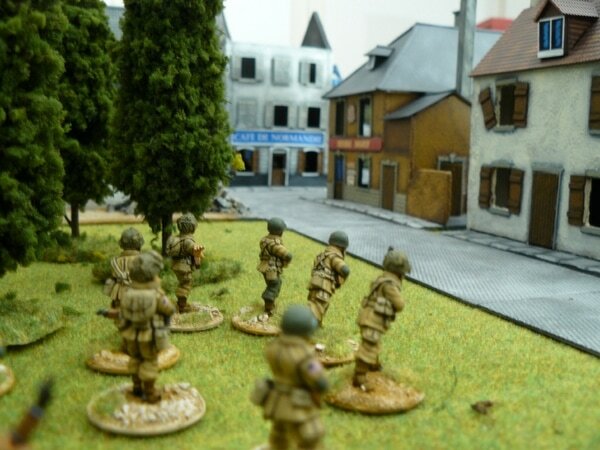 Then turned northeast to enter Carentan about 200m east of chez Desire Ingouf, near the train station. 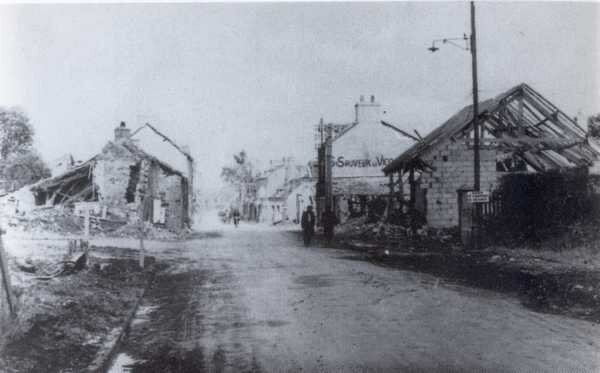 After searching for the real name of the building of Mr Ingouf, here's a picture with the road that took Easy Compagny / 506th PIR during the attack of Carentan. 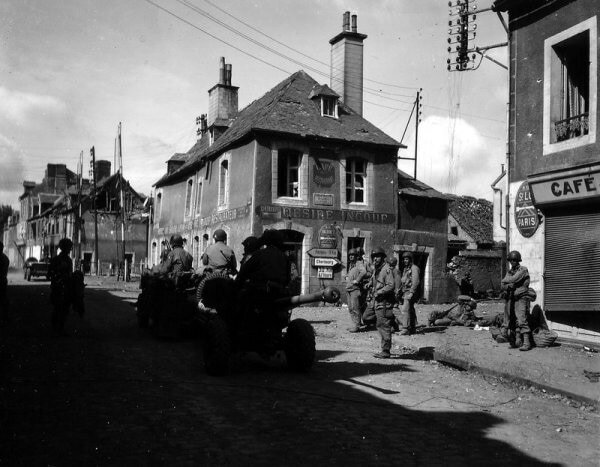 The 506th PIR was at the hamlet of La Billonerie on the roads to Periers. 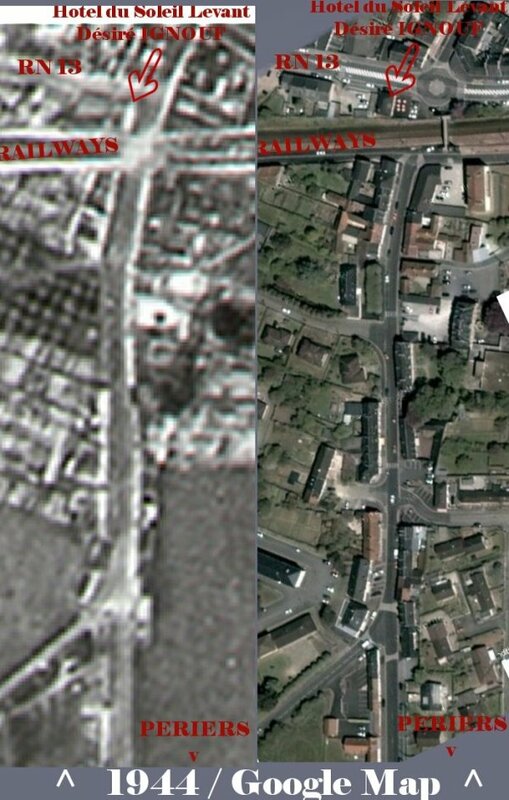 ​On the google map part you can see nowadays buildings which were in previous pictures. 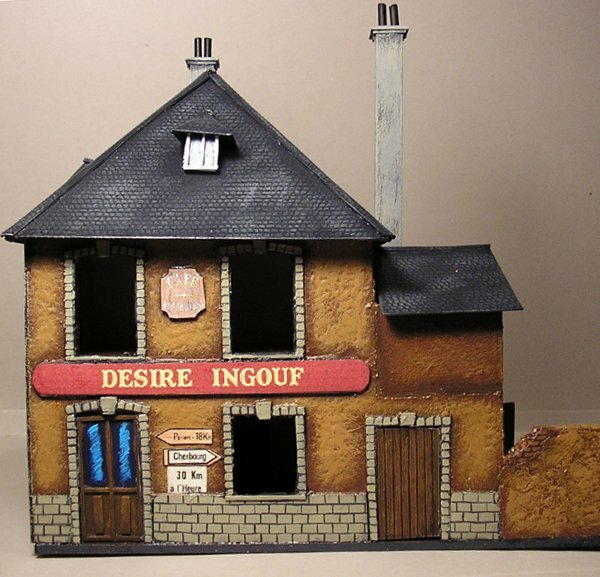 "Hotel du Soleil Levant & Desire Ingouf Restaurateur". 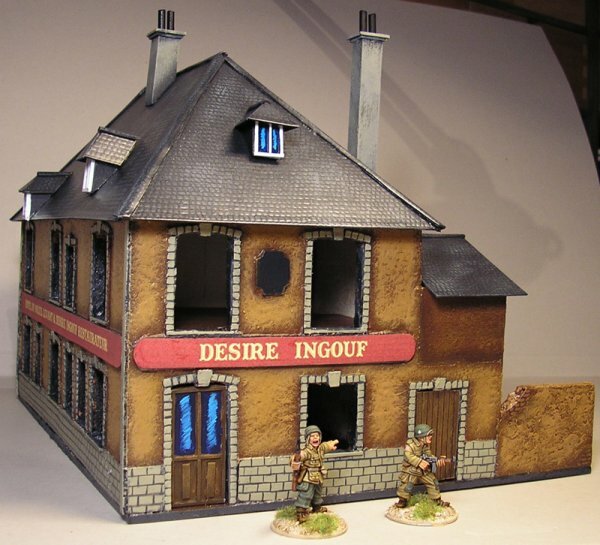 Literally - "Hotel of the Rising Sun and Desire Ingouf Restaurant owner"
I'm sure the GIs had some fun in there after they liberated Carentan!! 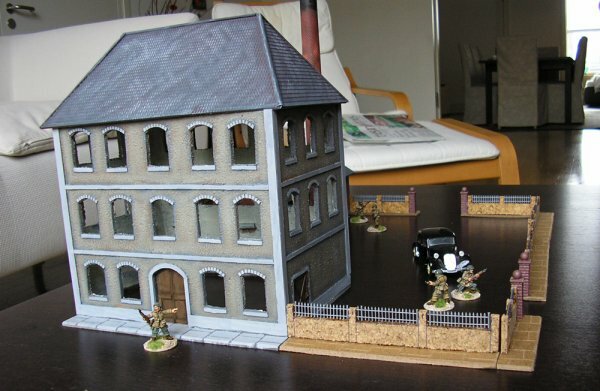 "...There is a house in New Orleans, they call the ..."
Where were the Fallschirmjägers and where did they opened fire? 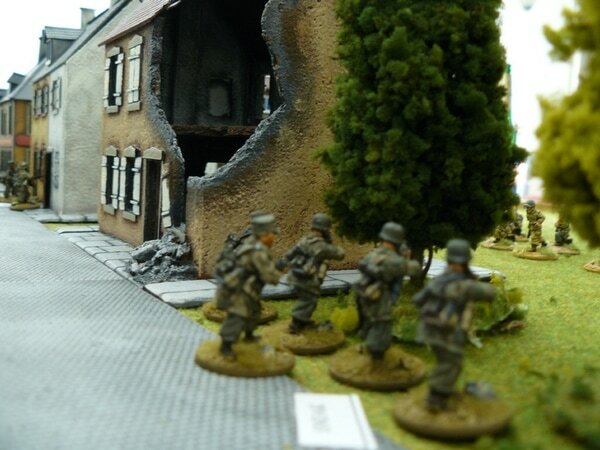 "(...)As we reached the outskirts of Carentan we started getting German rifle and machine gun fire. 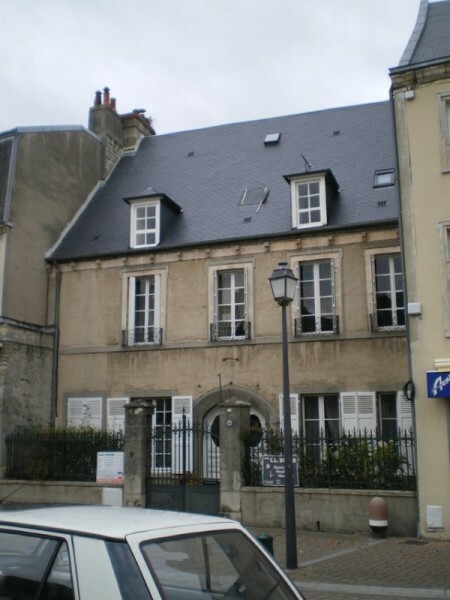 The houses in this area were somewhat like row houses except that there were enclosed stairways leading up to the second floors from the outside. I thought that we were getting sniper fire from one of the upstairs windows. Buck Taylor and I were working as a team at this point, checking and clearing the buildings and area as went, so I told him that I would go up the stairway to that room and that after he had given me enough time to get to the top he should throw a grenade through the upstairs window. I would then jump into the room and finish off whoever was there. I ran up the steps and stopped outside the door. 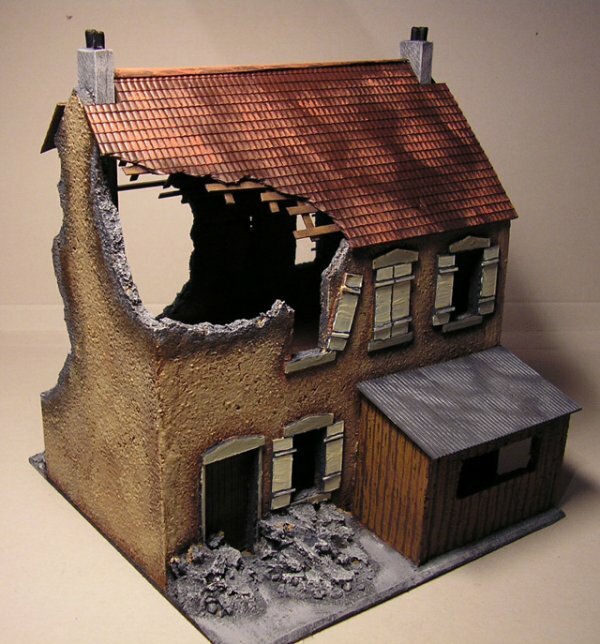 I heard the grenade thump into the room through the window and its explosion. 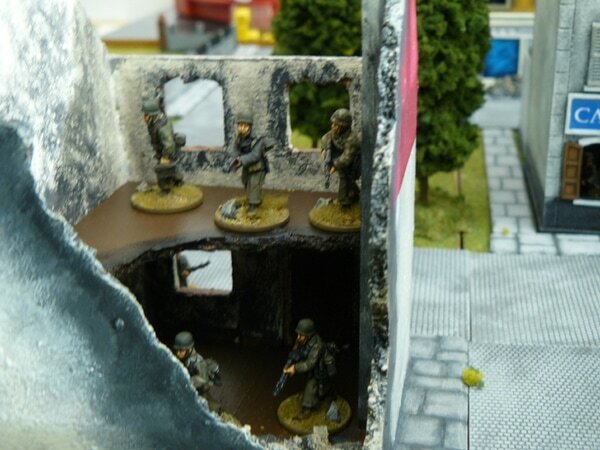 I threw open the door and leaped into the room, my rifle thrust forward ready to fire. I couldn't see a thing! The room was filled with dust and smoke from the explosion. 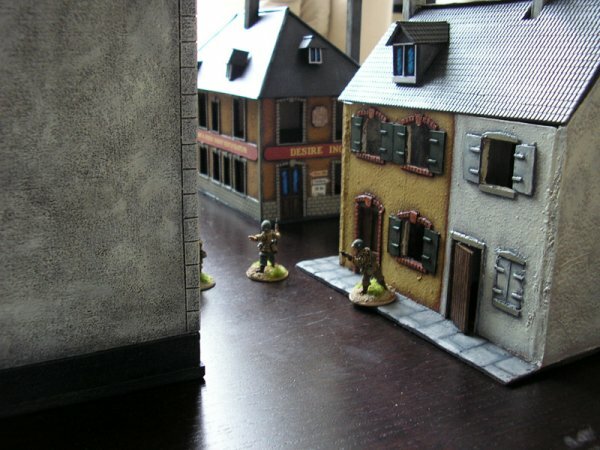 If there had been a sniper there and he had been able to shield himself from the grenade he would have had me silhouetted in the door, but the room was empty. 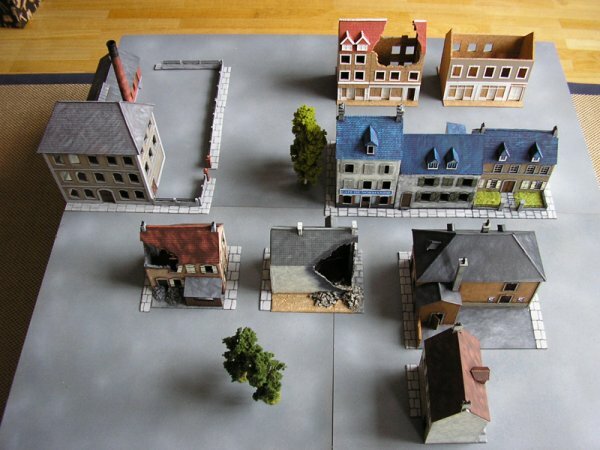 We continued to check buildings and work our way toward the town center. 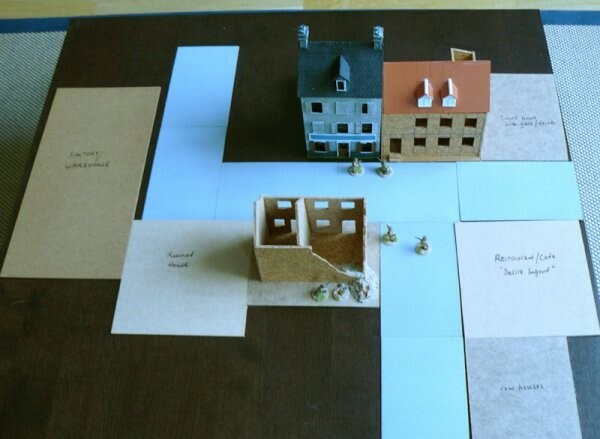 The rifle and machine gun fire against us seemed to decrease somewhat as we moved farther in , but mortar and artillery fire increased. Men were getting hit. Someone yelled that Tipper was hit across the street from me. I ran over. He was lying there conscious but hurt seriously. A medic was bandaging his face and his eye was obviously gone. He had major wounds in on arm and one leg. I told him he would be well taken care of and moved on. I came to a major road intersection, nearer the town center. 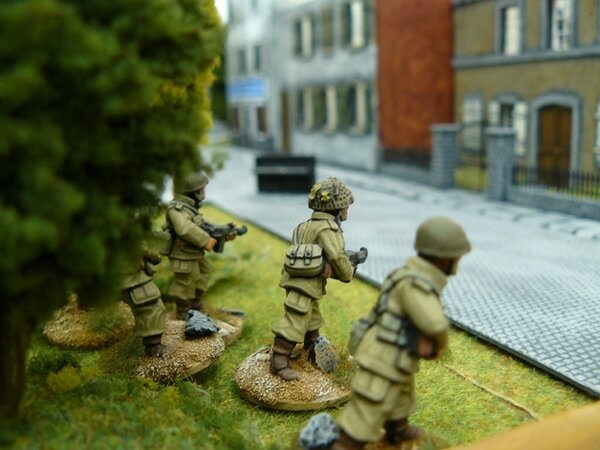 There was small arms and machine gun fire coming down the street from the right, across my front. Across on the other side of that street, on the continuation of the street I was standing on, were several E Company men. 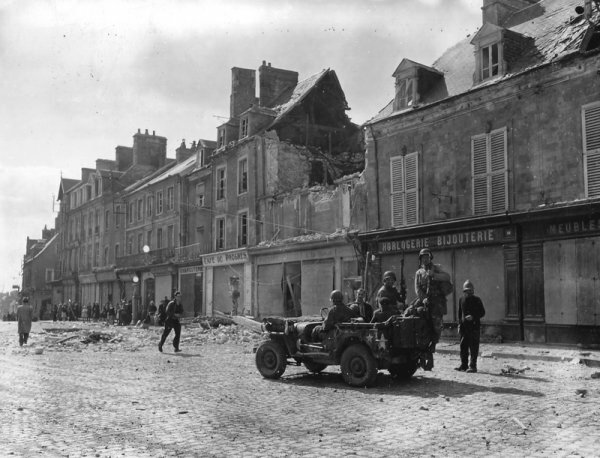 There were explosions up on the walls of the buildings on the left side of the street that they were on, and they looked to me like German 5cm mortar shells fired at a low trajectory so that they were coming in somewhat horizontally rather than dropping in vertically. I was on the right side of the street I was on, against a building on my right, and I did not think that the fire could get to me, but I started yelling to the men on the other side to move farther along. I thought that in the noise and confusion they might not realize that mortar fire was being directed at them.(...)" 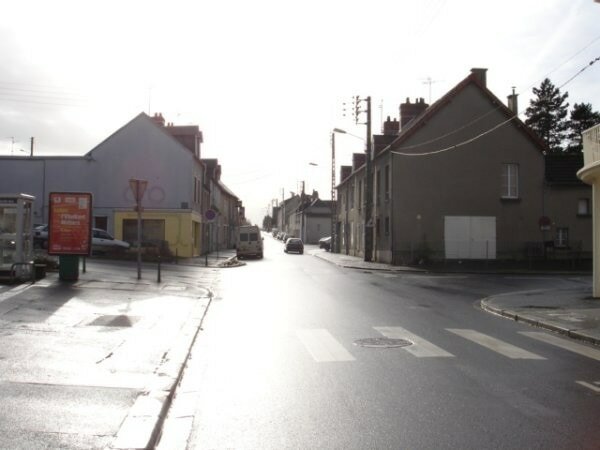 After reading this Sgt Perry thinks that the US Paras were attacked when they reached the first crossroad and that there was a house to house fight along the road up to the crossroads with the RN13 and that Lipton was wounded here (near the Desire Ingouf restaurant). 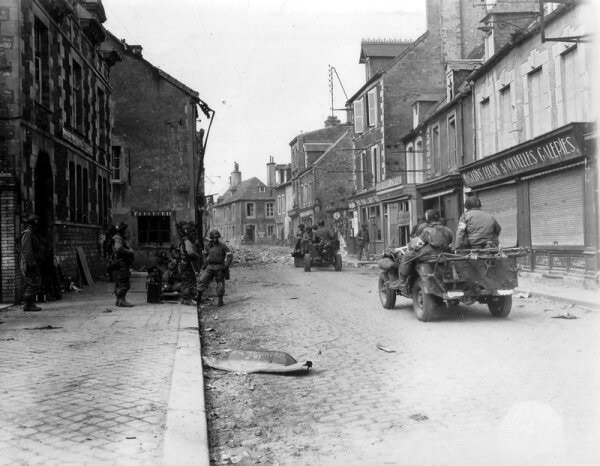 I must admit I am still quite confused about the exact route taken by Easy company from La Billonerie into Carentan. 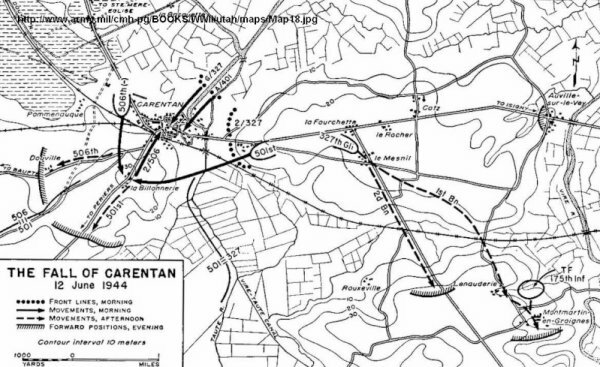 If you follow this map, it suggests 2/506 (incl Easy) attacked La Billonerie and then moved up the Periers road into Carentan (passing the rail junction and the restaurant Desire Ingouf). 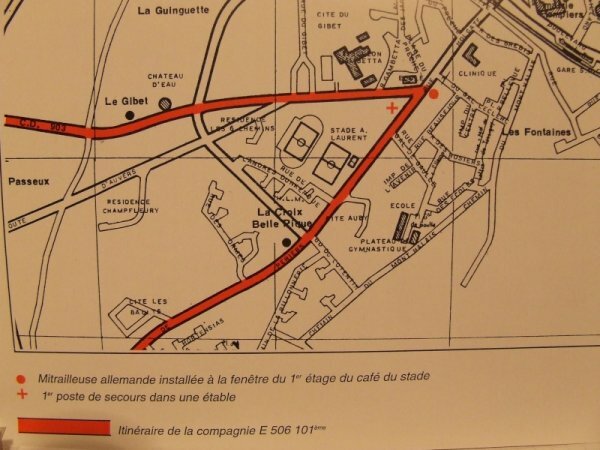 On the other hand, if you follow this map, then E/2/506 may have attacked La Billonerie from the west, then continued in a NE direction into Carentan, that means passing the train station and the Mairie/Ecole. 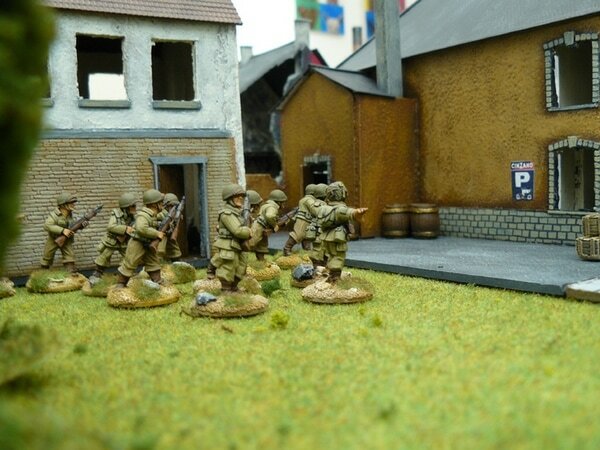 Anyway, the only factory I can find in Carentan at that time was the Gloria milk factory which is in the NE of Carentan, near the river port, which is totally opposite to the direction that Easy Company arrived in Carentan. This is an excerpt on Carentan from the US Army official history "From Utah Beach to Cherbourg"
"The 2d Battalion (506th), meanwhile, had moved out astride the main road leading into Carentan from the southwest. 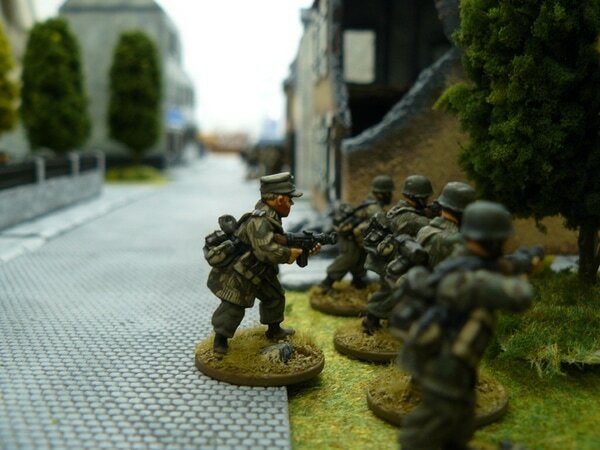 It received harassing machine-gun fire and interdictory artillery fire from the south most of the way into town. 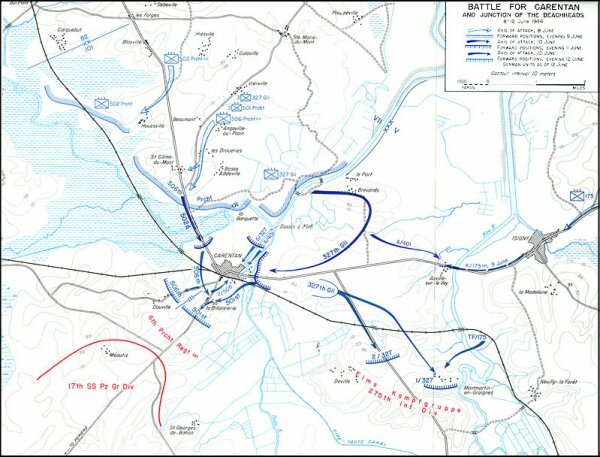 As the battalion entered, it met the 1st Battalion, 401st Glider Infantry, which had already come in from the northeast. 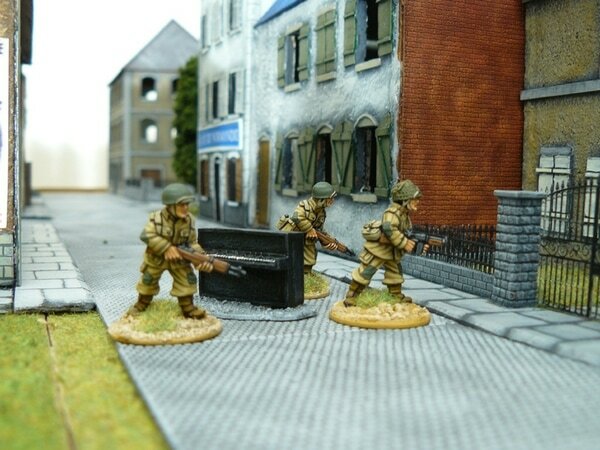 This unit had pushed a patrol to the edge of the town before dawn, but it still faced the enemy rear guard and was temporarily stopped. 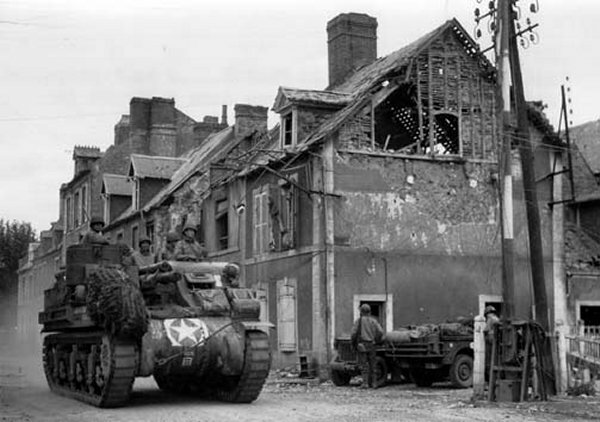 At 0600 it attacked out of the wood at Bassin a Flot and drove rapidly into the center of Carentan. 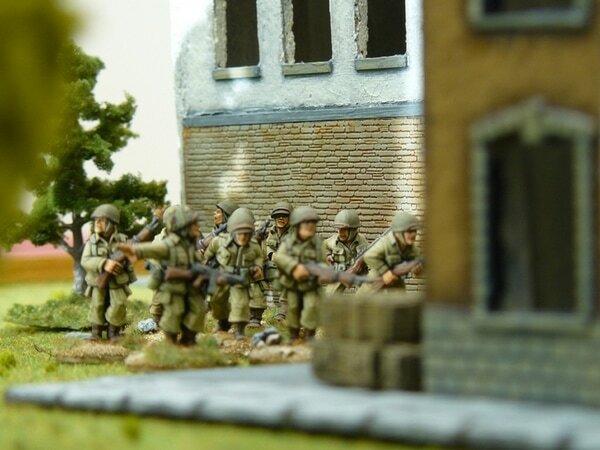 The meeting with the 2d Battalion, 506th Parachute Infantry, occurred about 0730 after a short fight with enemy stragglers around the railroad station." 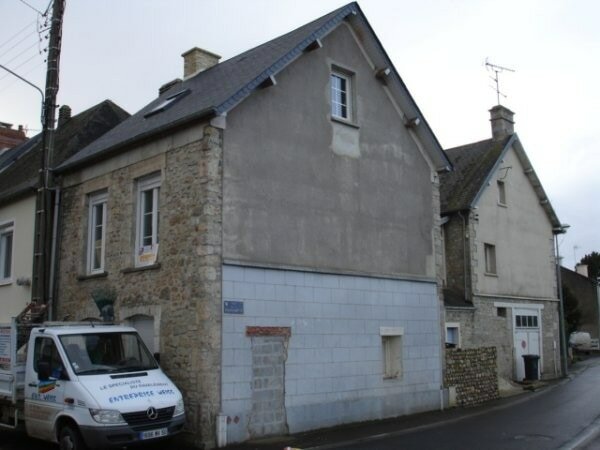 Based on this short excerpt, and the recent discovery that this house (located just south of the level crossing opposite the restaurant Desire Ingouf) might be the location of the aid station that treated Blithe and Winters. 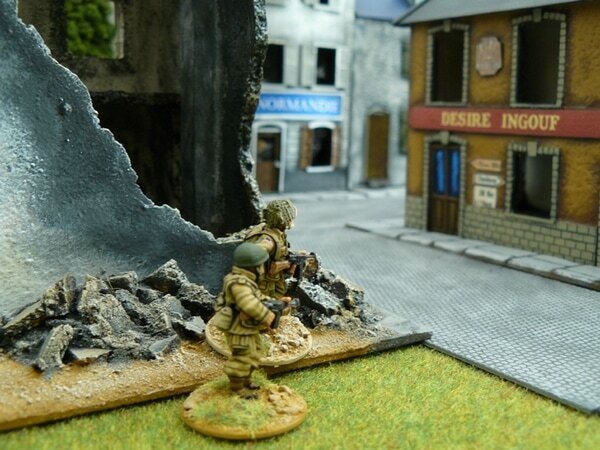 I think it is correct that Easy Company moved up the Periers road and past the restaurant Desire Ingouf. 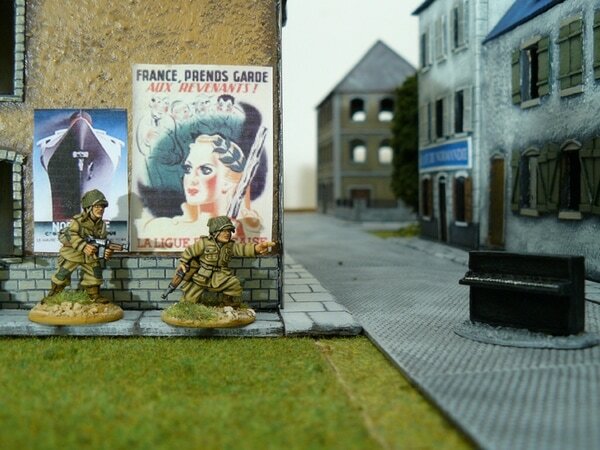 This picture that should be the Auvers/Periers crossroads, with Carentan in the background ​. 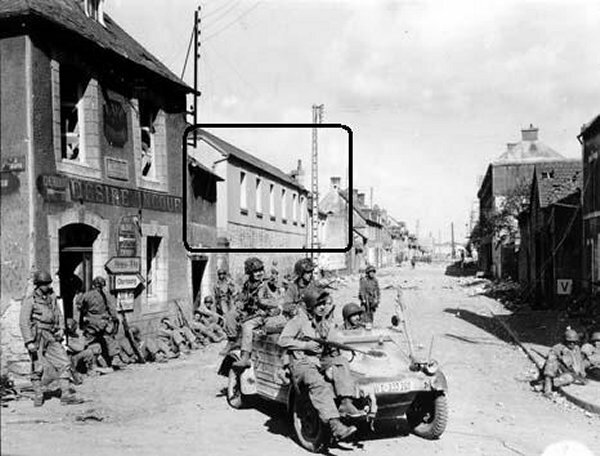 On the right side of the road behind the Belgian gate is the "Cafe du Stade" wherethe MG42 was located and near the Para on the left, the cd903 (from Auvers) . 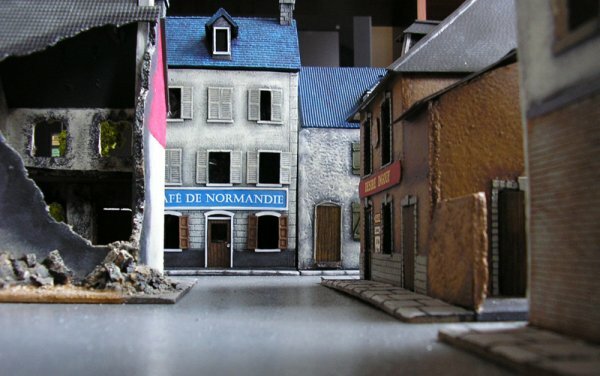 The Cafe de Normandie in the TV series looks nothing like the real Cafe du Stade! 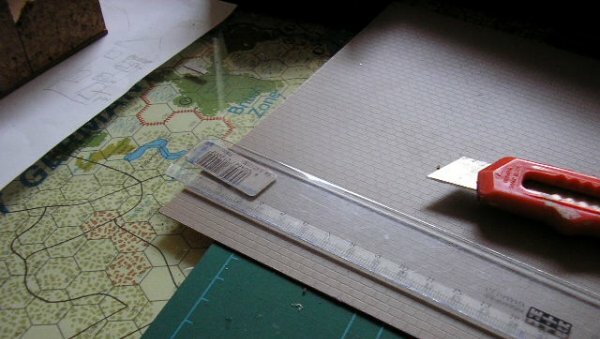 ​The map is a little confusing. 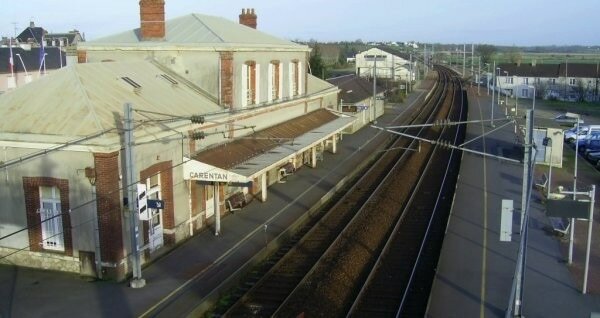 The red marked route suggests that Easy company did not move north into Carentan, instead moving south towards Periers. The position of the first aid station is also different. Sgt Perry has found out that the first aid station is not the building near the railroads.